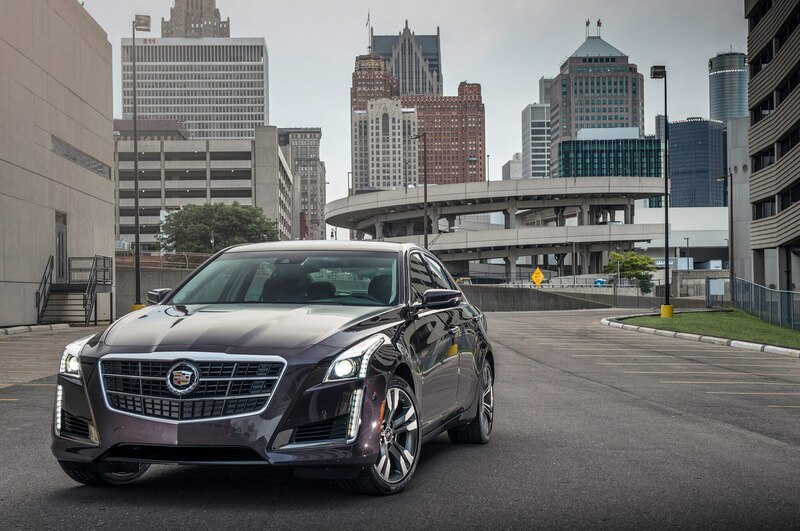 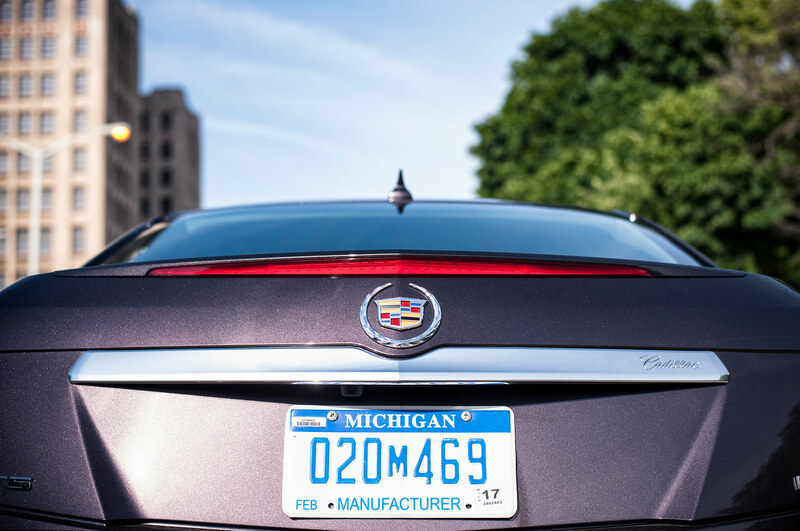 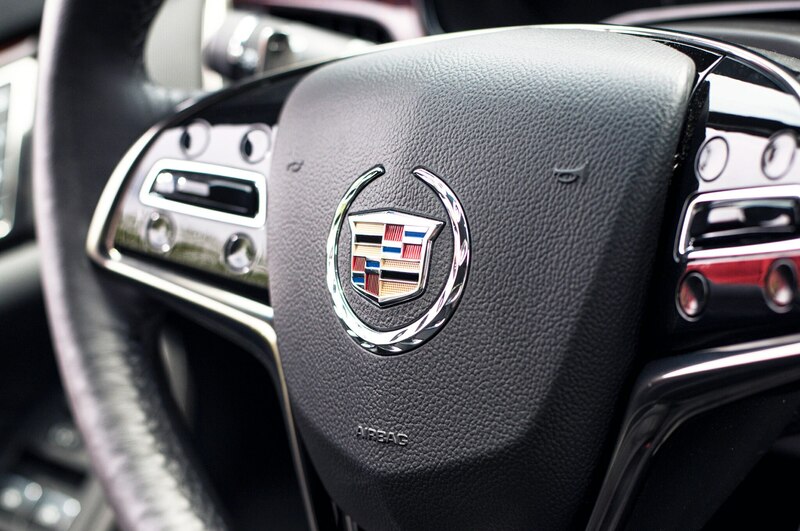 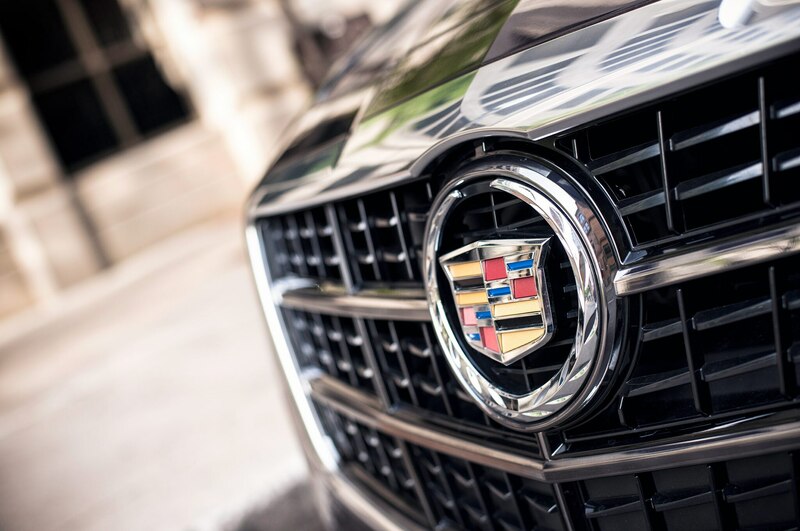 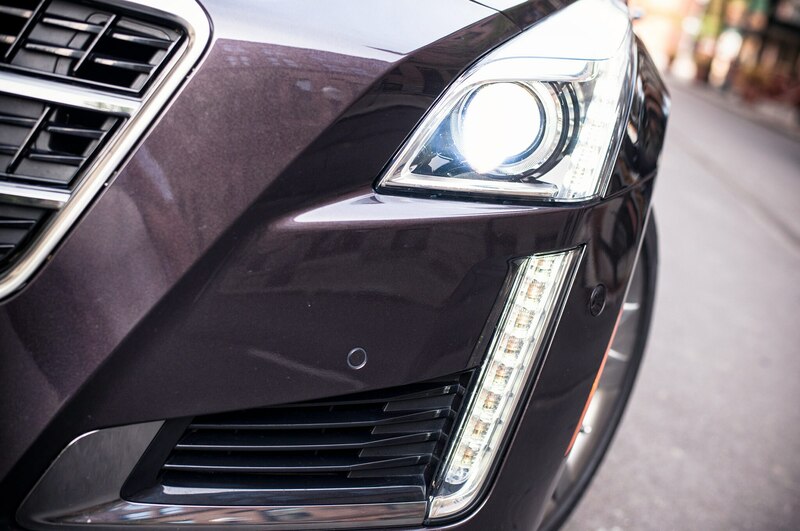 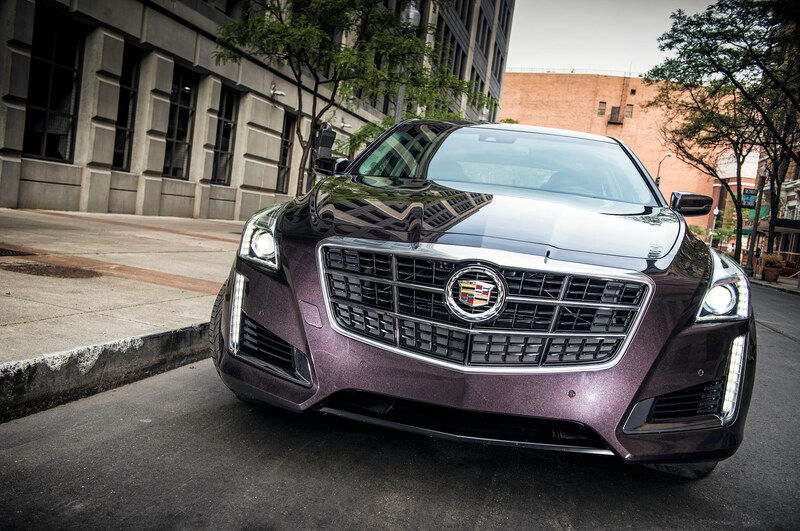 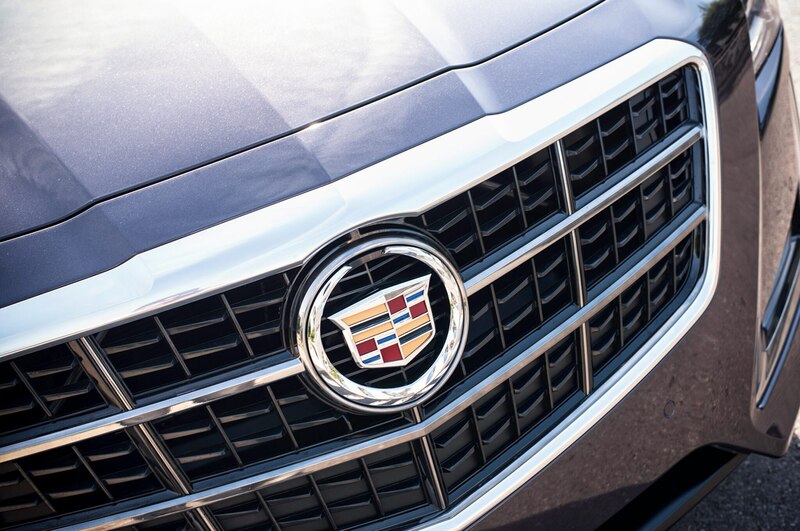 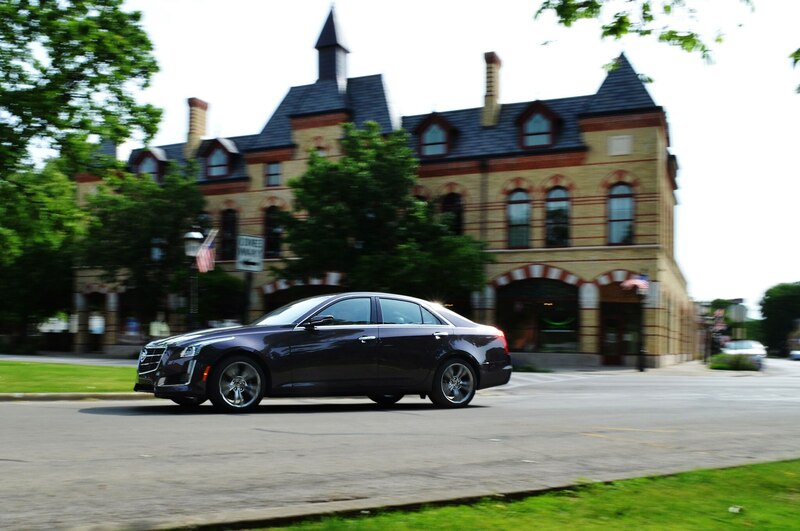 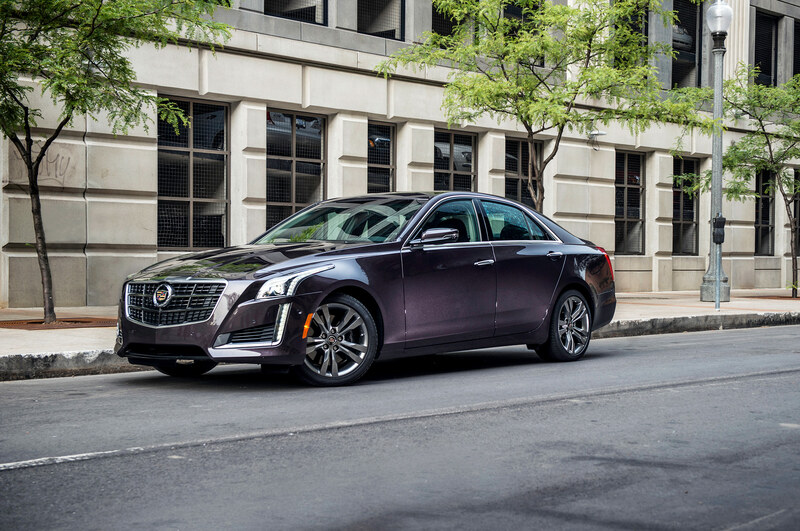 From the moment it replaced the Catera, the Cadillac CTS established itself as the brand’s first credible shot at taking on BMW, Mercedes-Benz, and Audi as a competitive luxury brand. 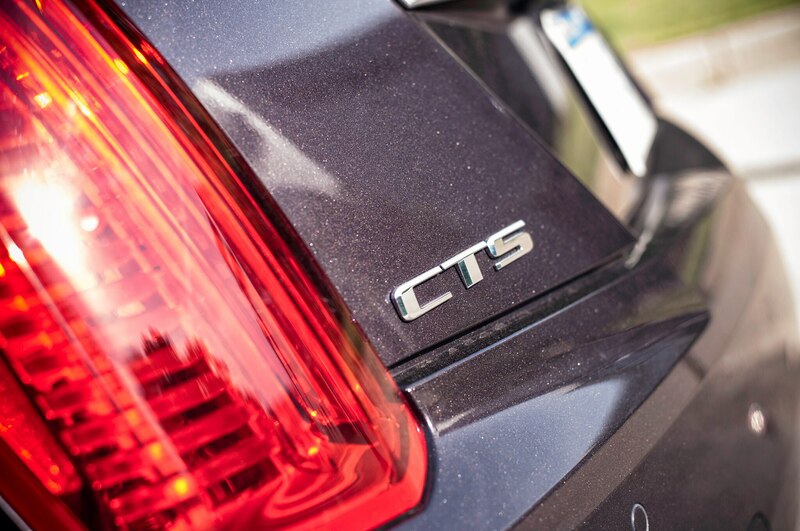 More than a few believe the present CTS, launched in the 2014 model year, is already on the German competition’s rear bumper, thanks in part to Cadillac chief engineer David Leone’s adherence to Lotus founder Colin Chapman’s “add lightness” dictum. 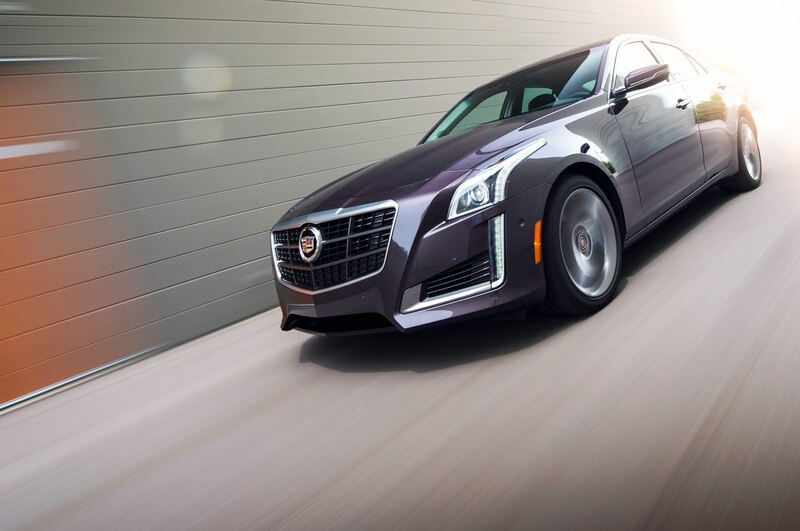 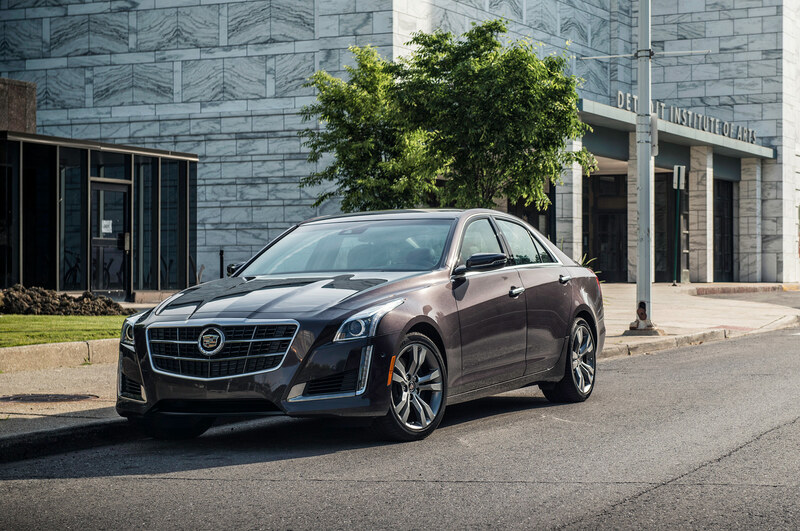 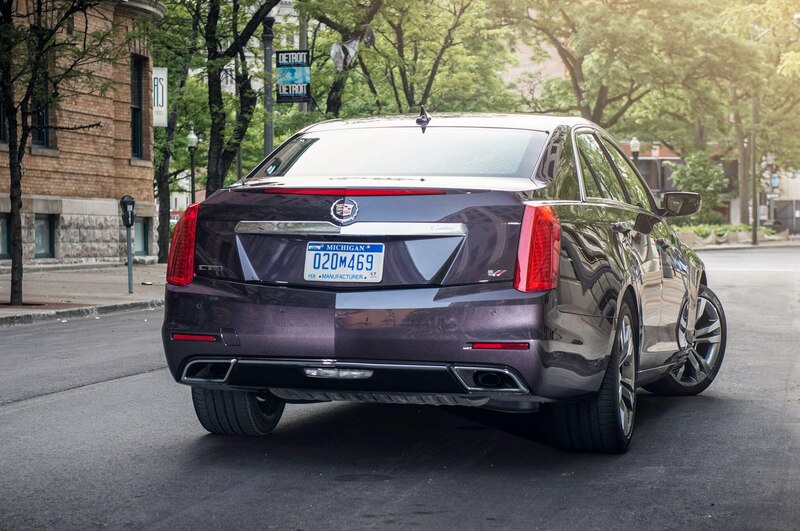 Though longer in wheelbase and overall length than the second-generation model, the alchemical use of aluminum, high-strength steel and strategic body reinforcement on the latest CTS has dramatically lowered the car’s overall weight, making it the lightest car in its class. 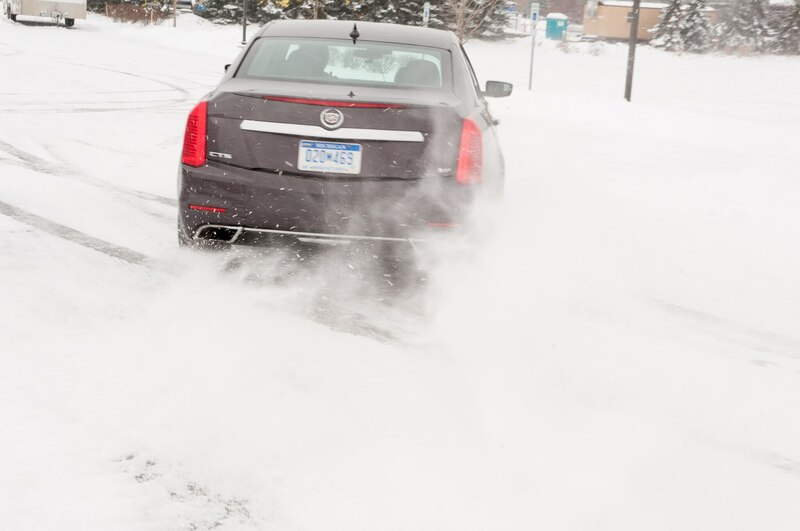 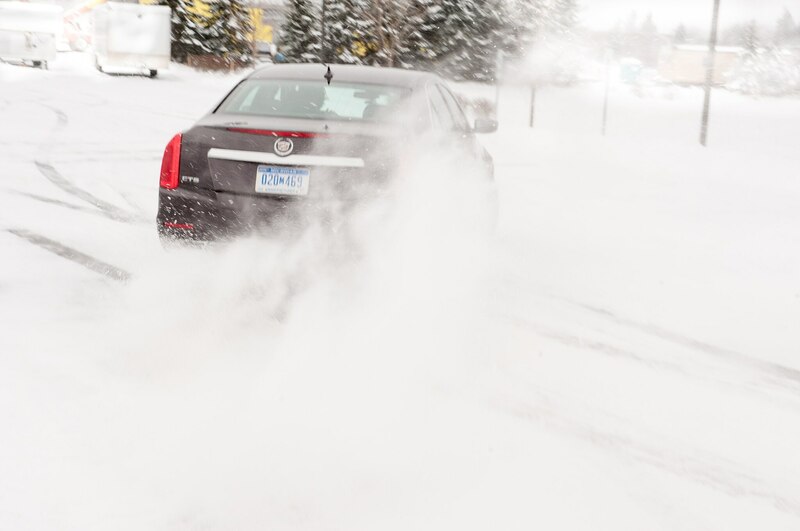 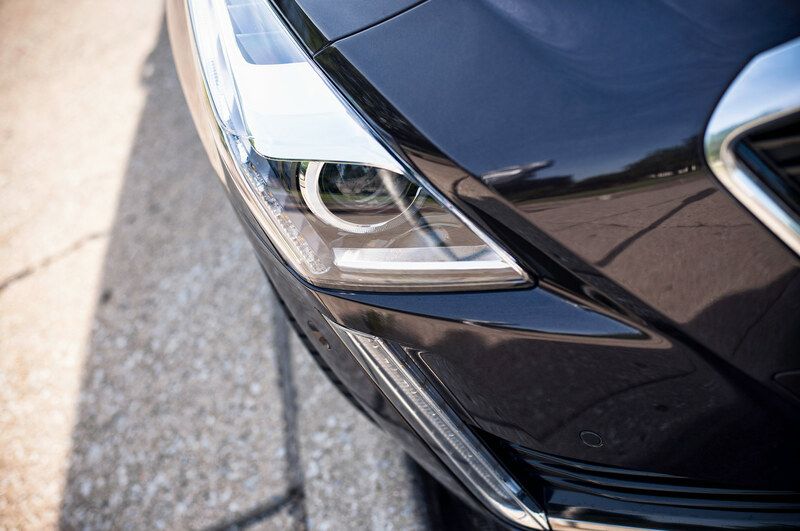 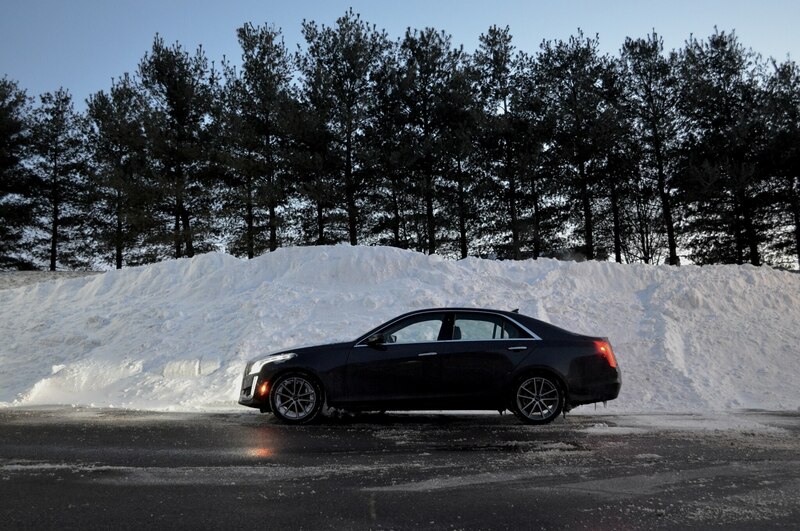 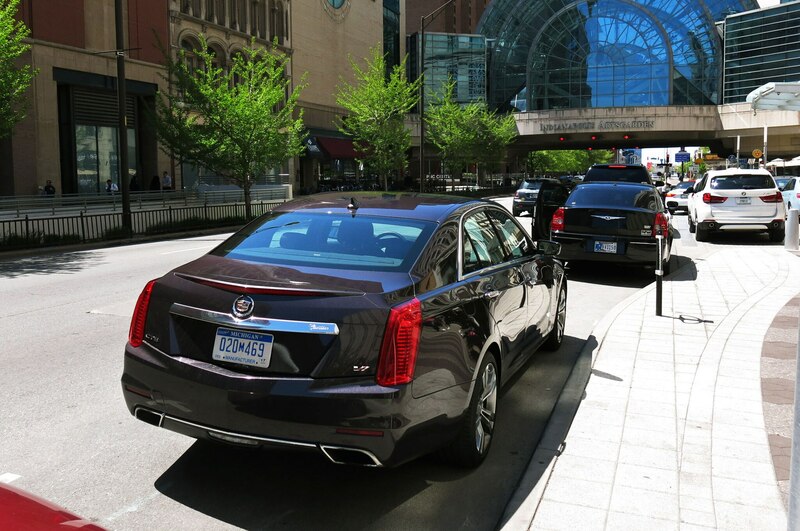 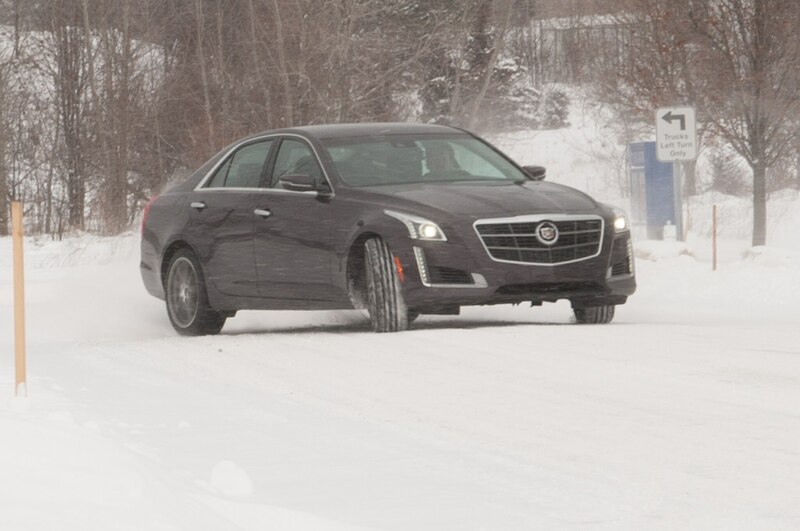 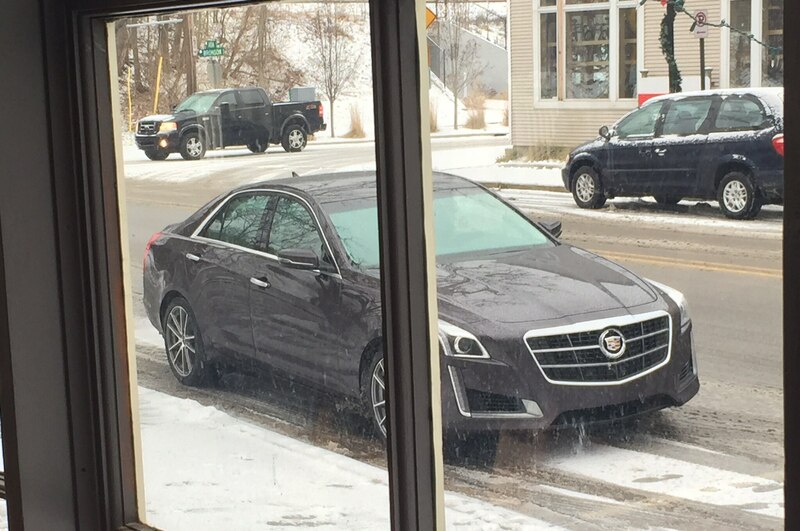 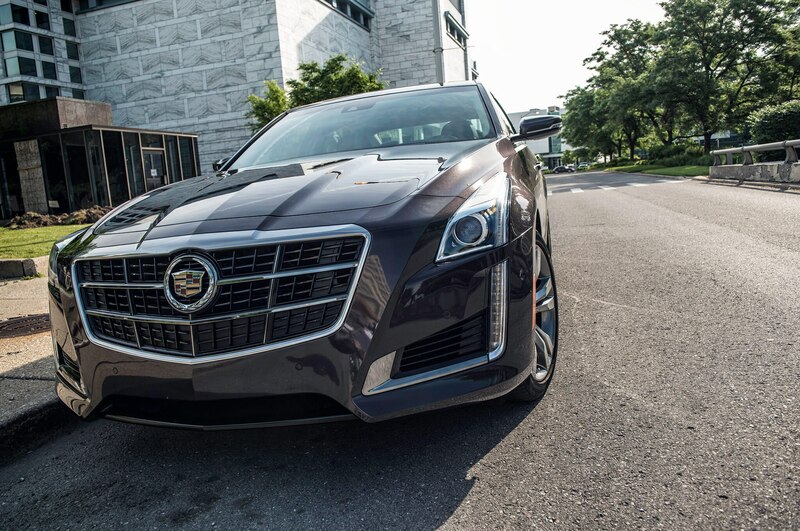 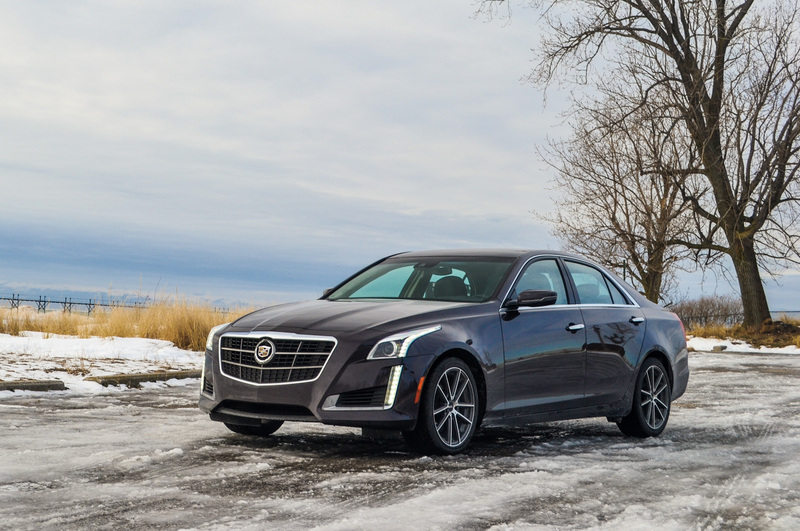 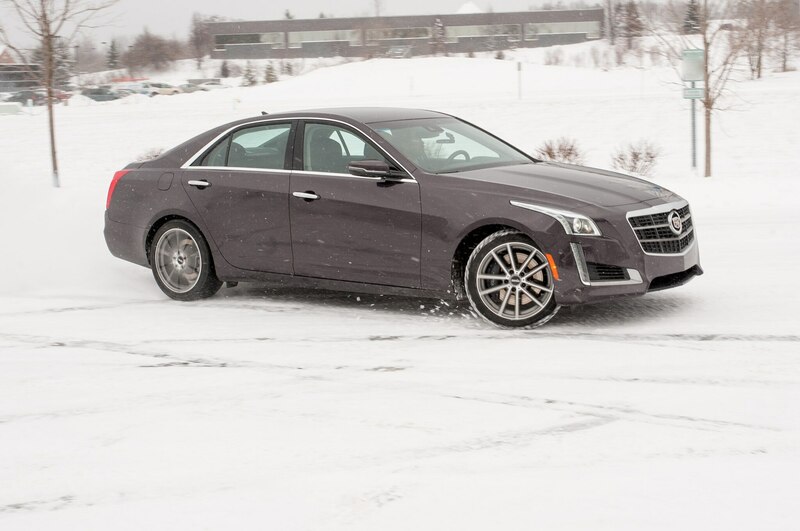 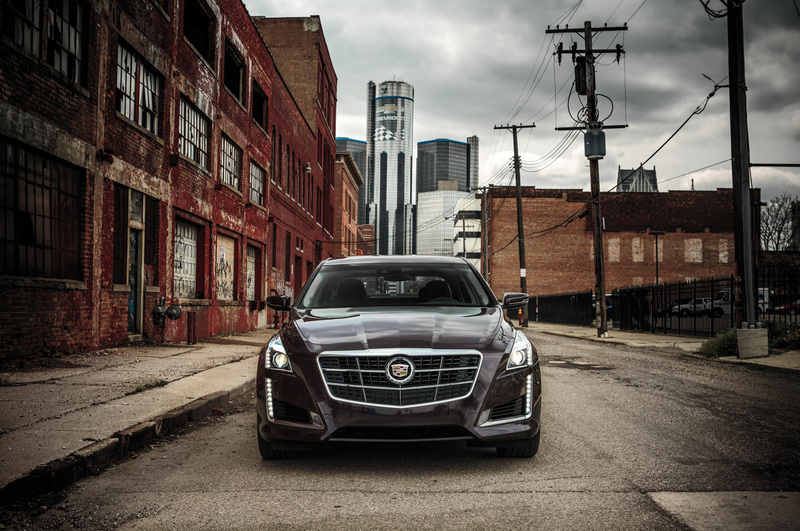 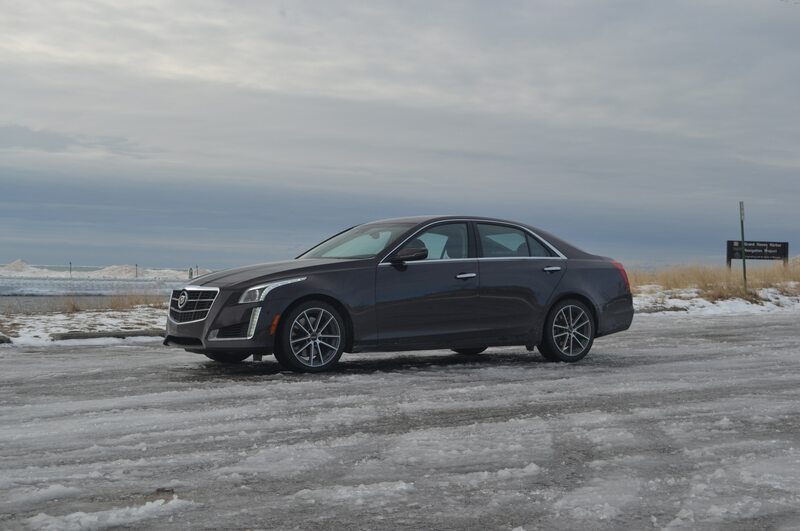 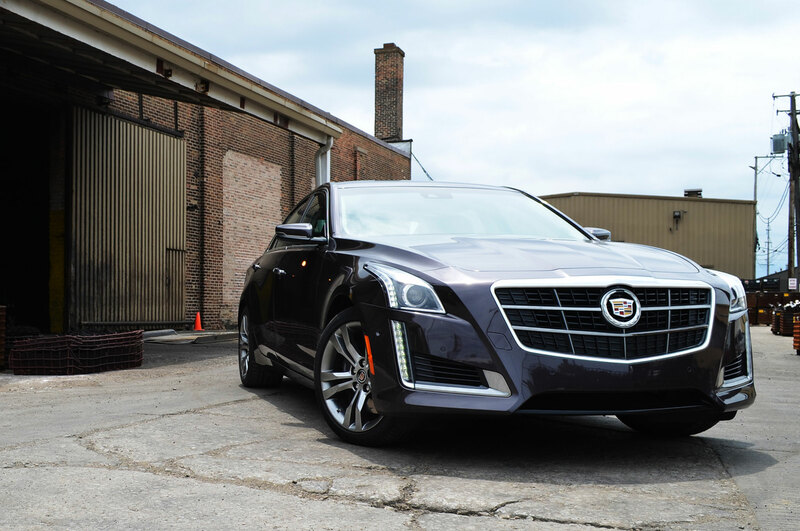 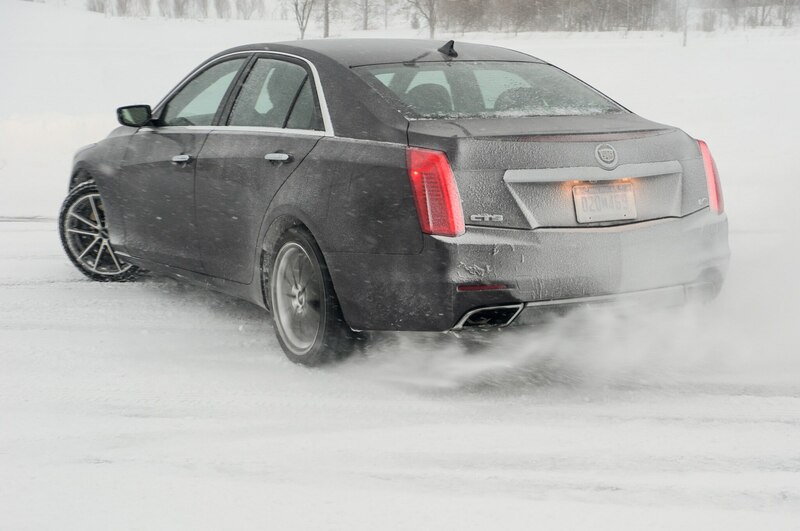 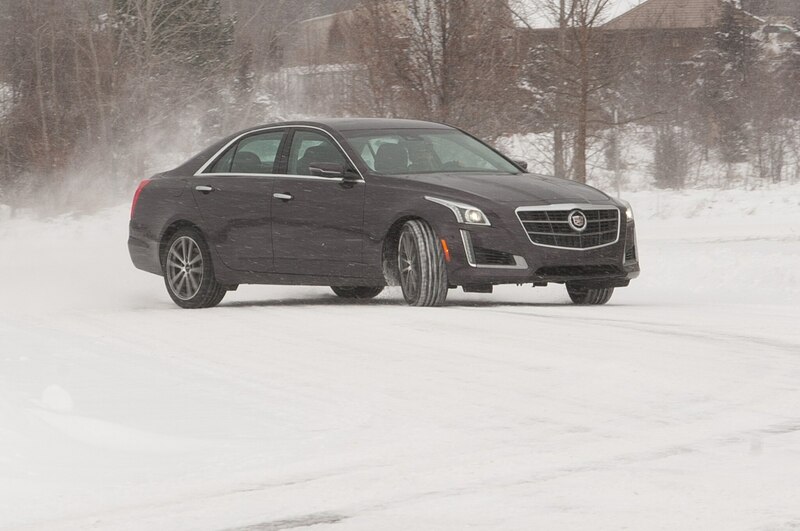 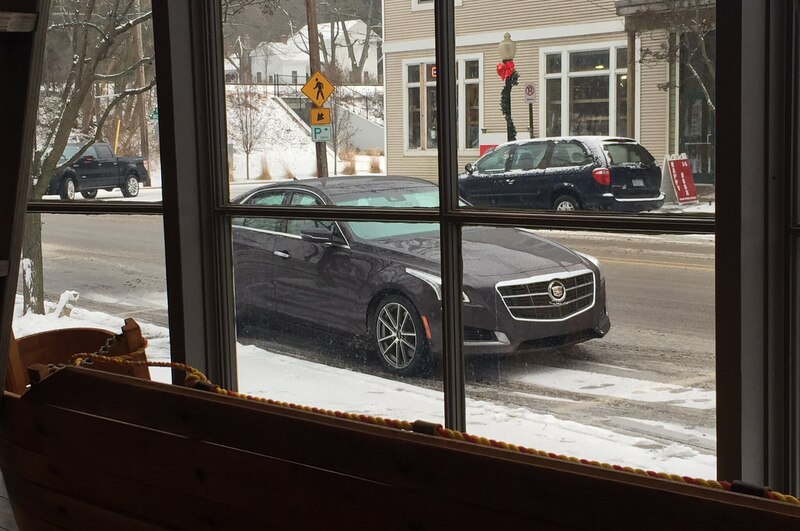 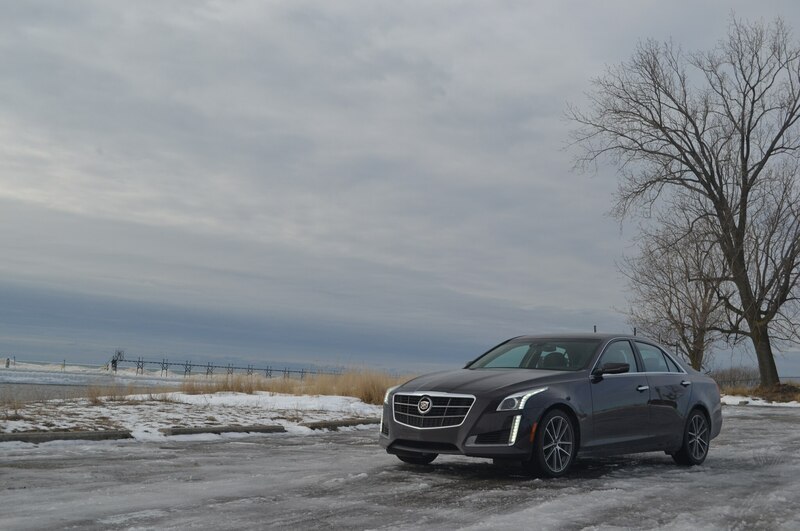 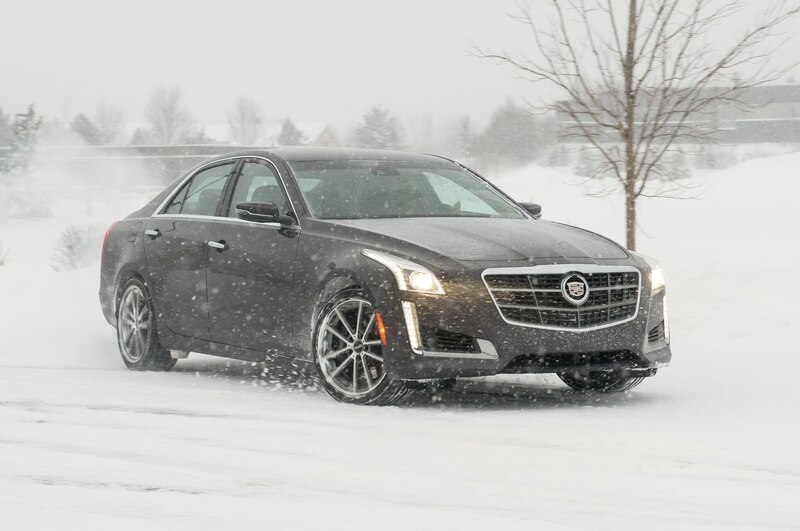 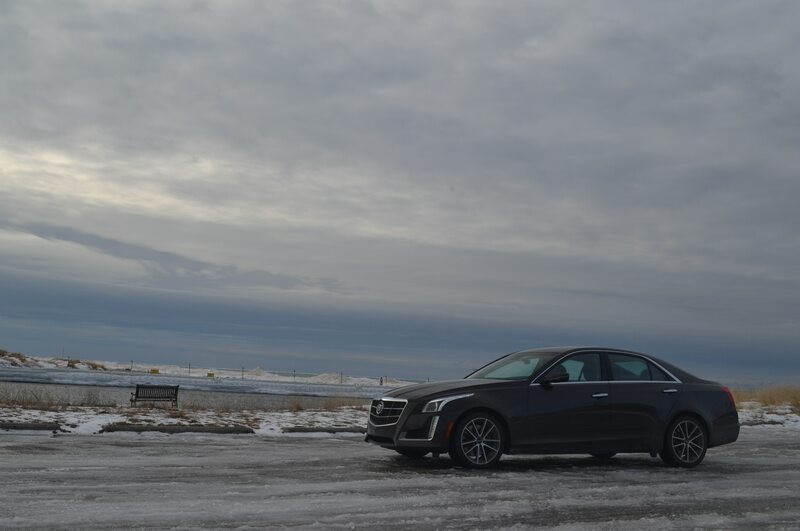 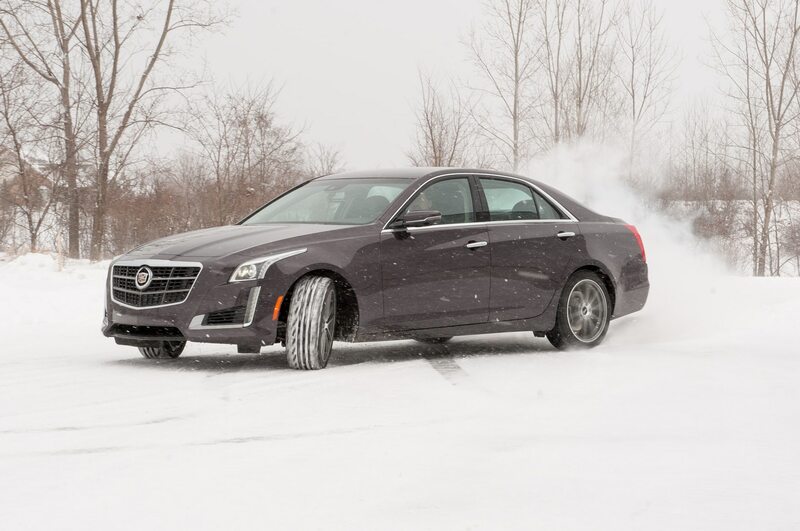 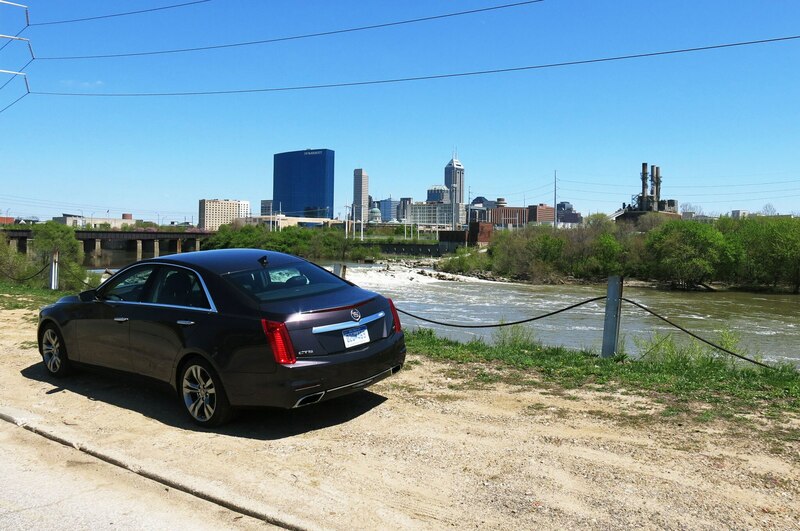 We were impressed with the new CTS when we first got into it, so much so that we named it one of our 2014 All-Stars and subsequently ordered a Cadillac CTS Vsport for a Four Seasons test. 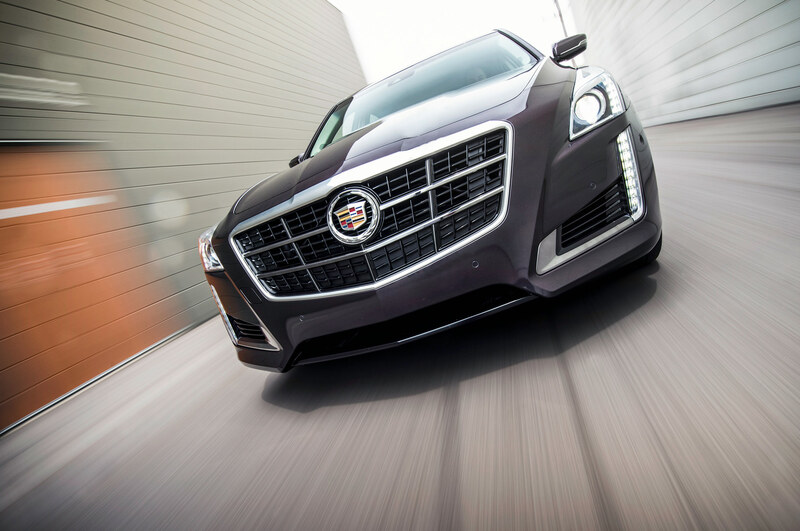 This twin-turbo, 3.6-liter V-6-powered model promised a comfortable compromise between the more sedate base 2.0-liter turbo-four and naturally aspirated V-6 models and the 640-hp, supercharged 6.2-liter V-8 CTS-V that was still two model years away. 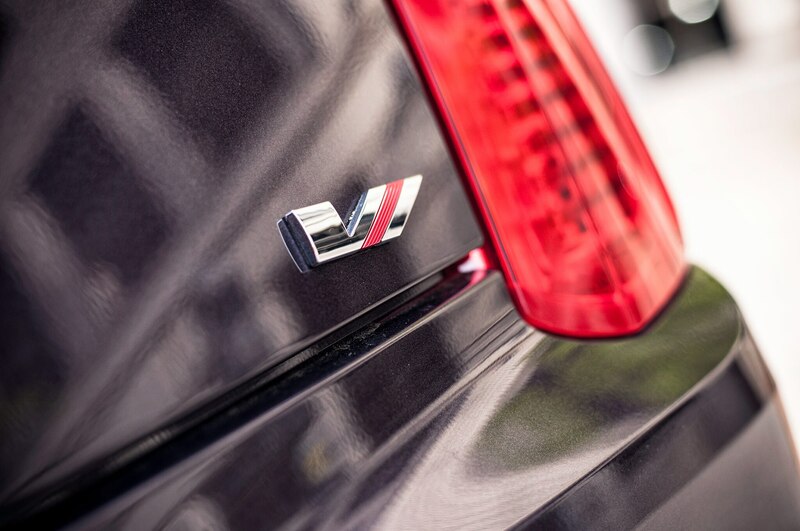 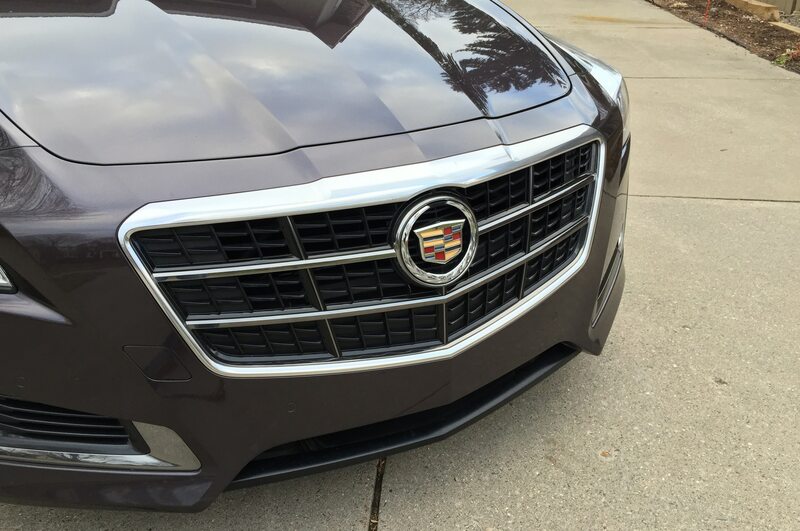 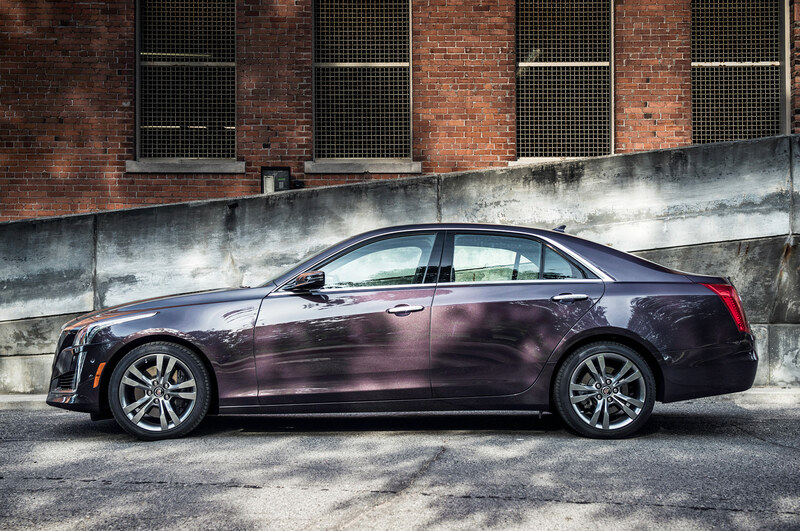 The basic Vsport package provided pretty much everything we wanted in a Cadillac sport sedan. 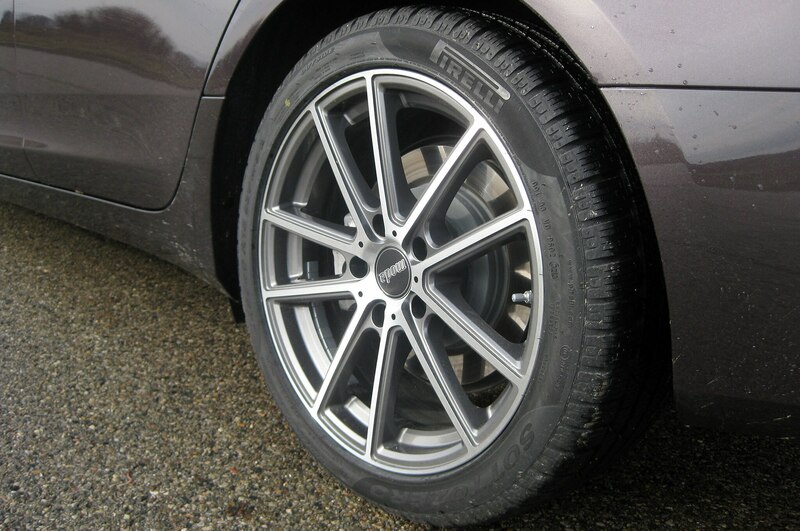 Besides the aforementioned twin-turbo six, our Vsport included a capable eight-speed automatic, performance suspension with Magnetic Ride Control, electronic limited-slip differential, dual exhaust, Pirelli P Zero run-flat tires, Brembo brakes up front, and silver-painted aluminum 18-inch wheels. 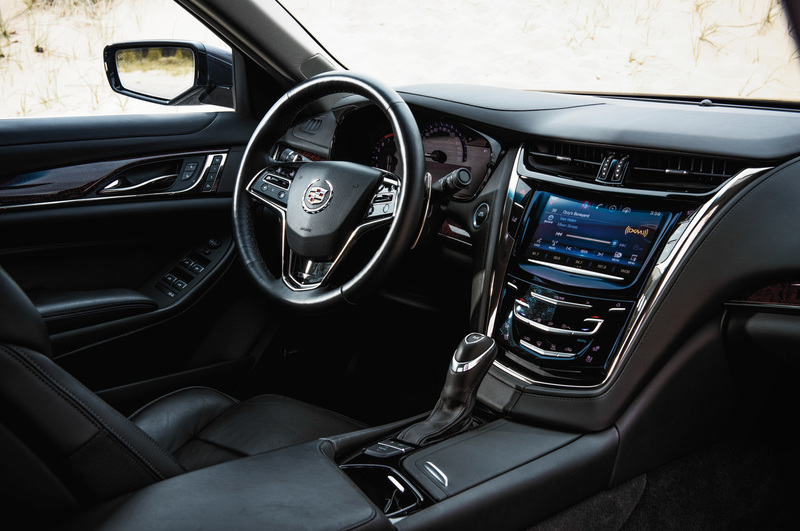 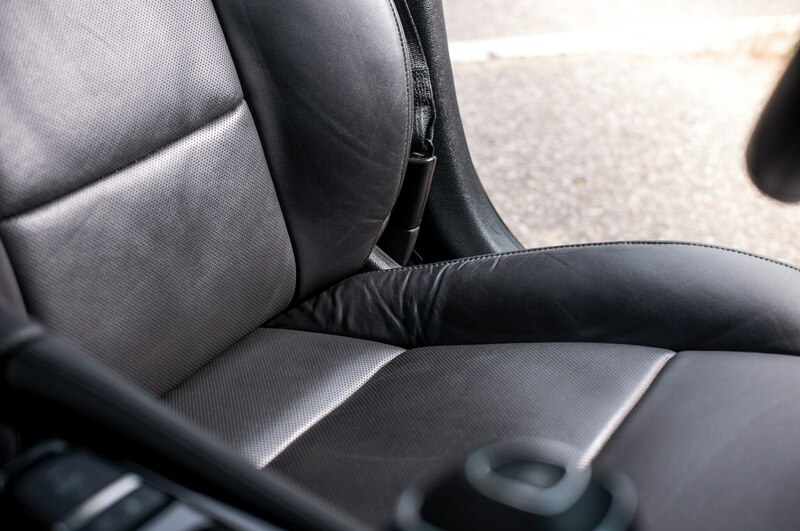 We didn’t tick the box for the $10,000 Premium package, which would have added full-leather seating instead of just the surfaces, plus a sunroof, configurable instrument panel, and other goodies that eat into weight savings. 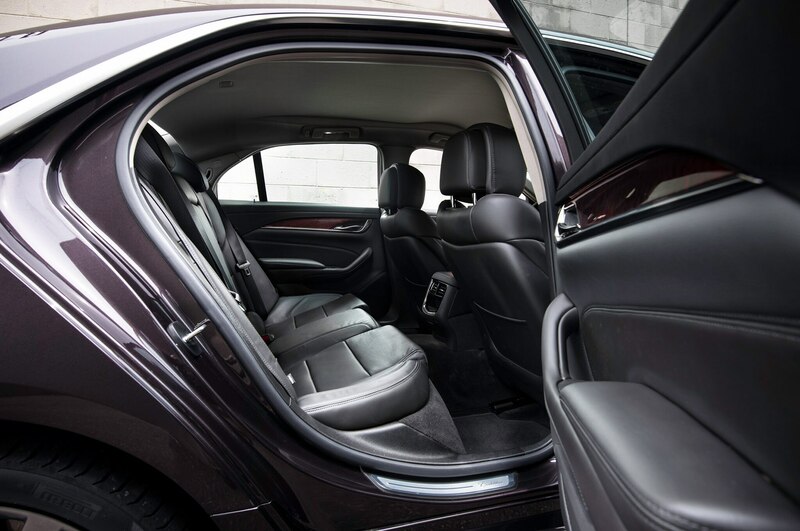 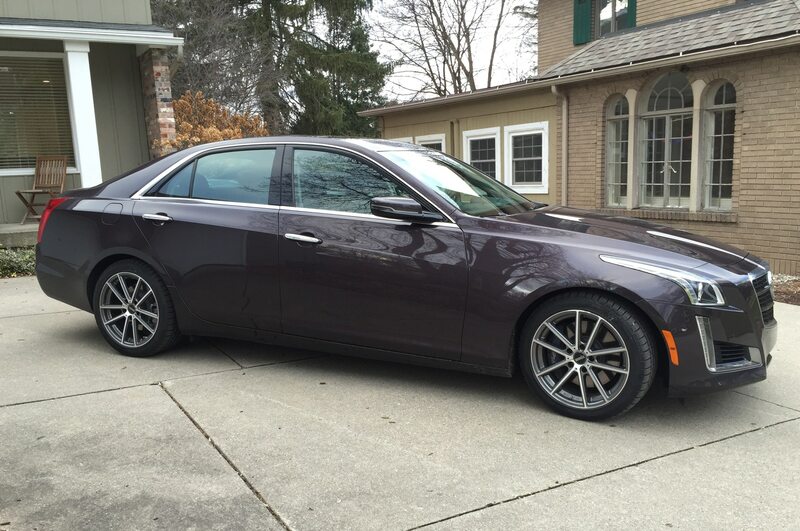 Our only option was the car’s $495 Majestic Plum Metallic paint job, which pushed the bottom line to $60,490. 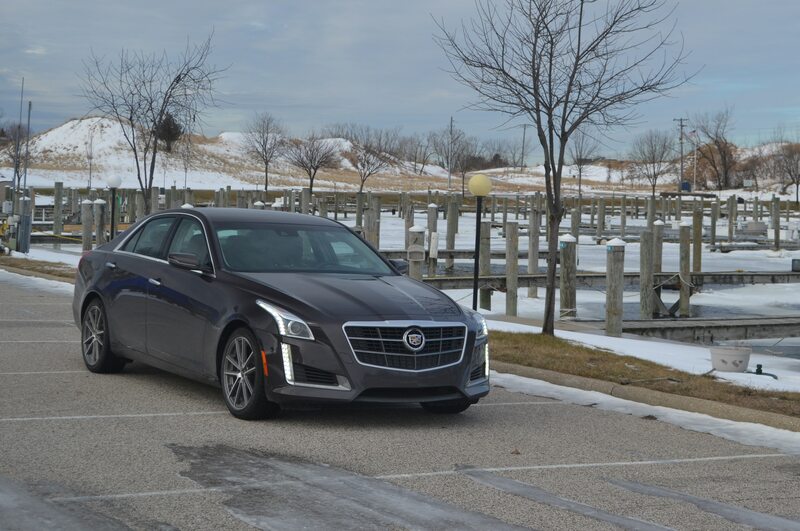 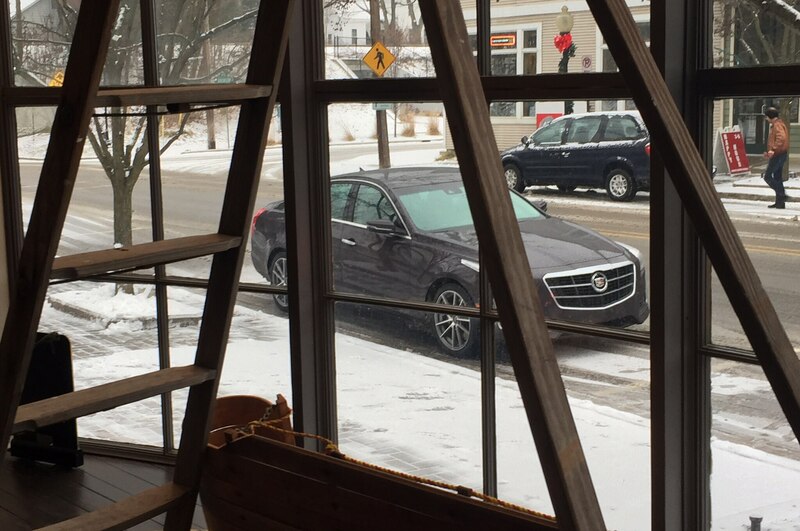 We were short on long trips with this car, but there were trips to Philadelphia and quick jaunts to the Milwaukee area, Nashville, and Michigan’s idyllic Leelanau Peninsula. 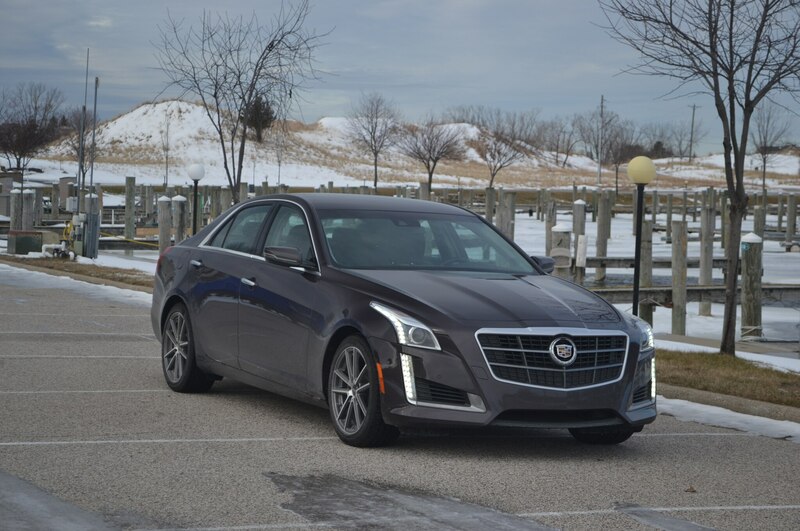 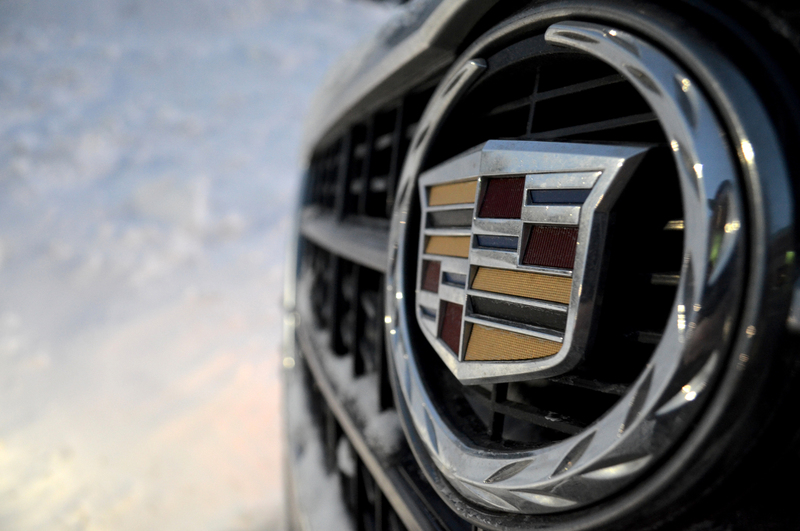 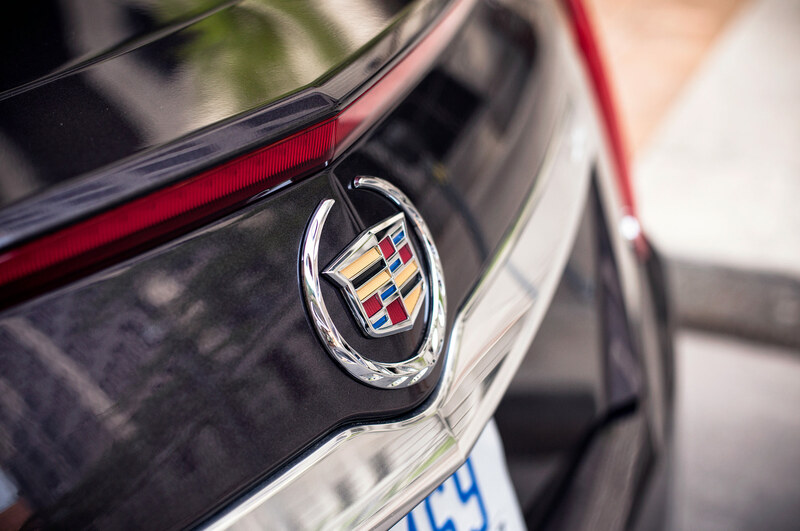 But no matter how near or far we went, the consensus from staffers was that the new Cadillac is moving in the right direction with the Vsport’s sport/luxury mix. 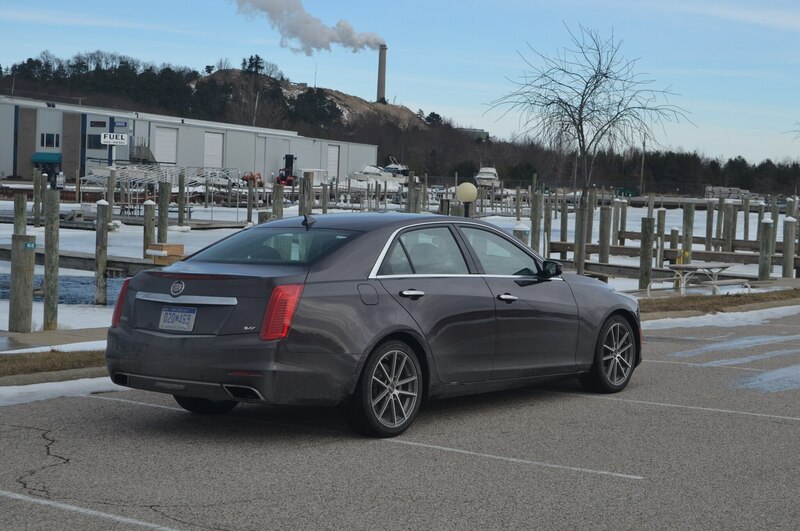 On a weekend blast to New Berlin, Wisconsin, where this reporter’s parents reside, I found the ride stiff though not overly harsh. 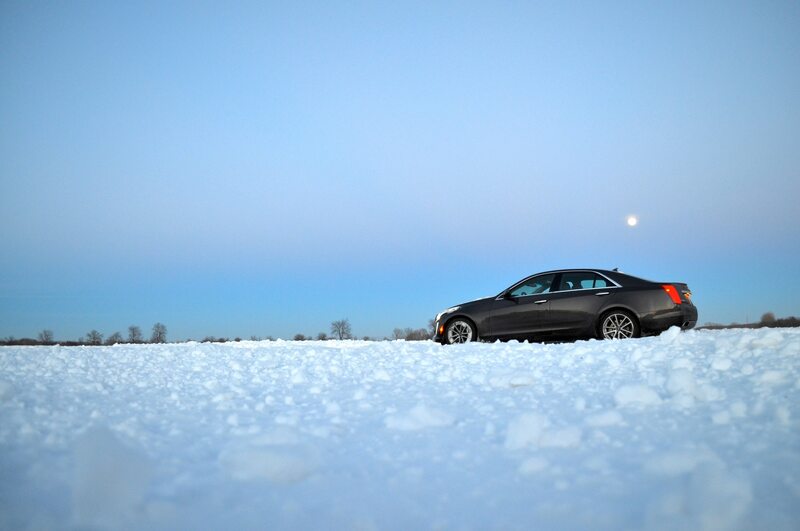 (The car remained in Tour mode for most of the drive.) 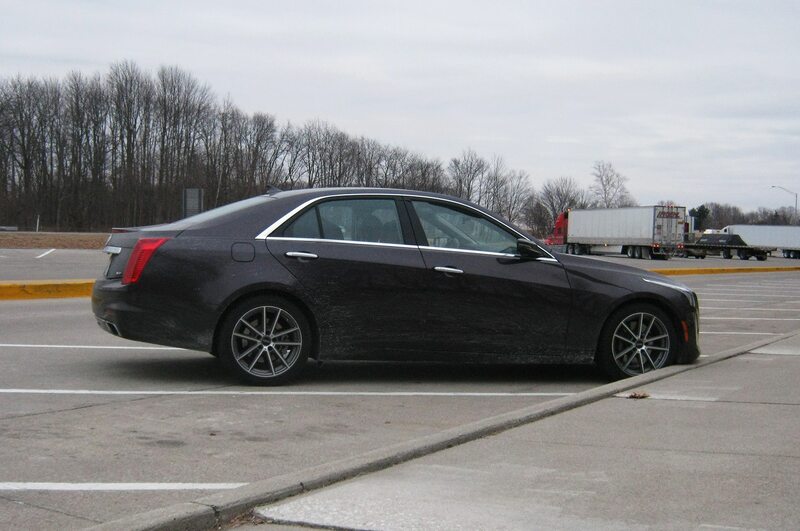 The parents, who own a 2008 CTS, were suitably impressed. 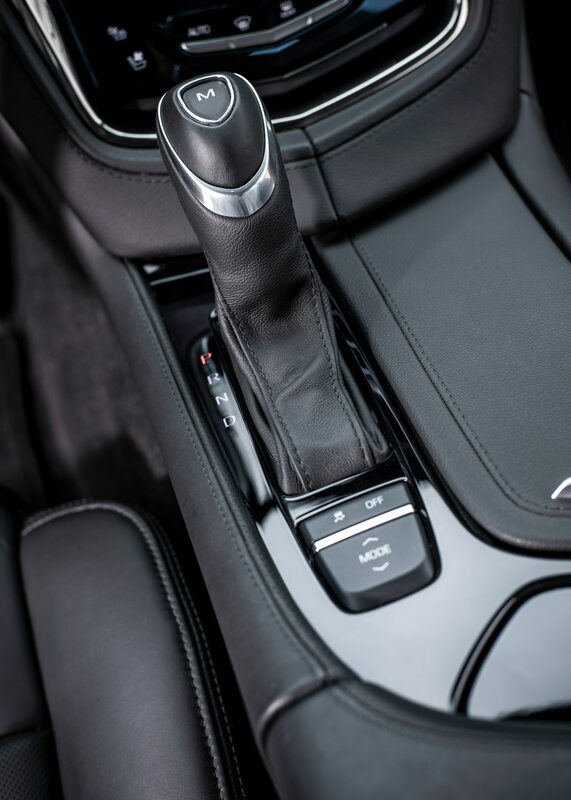 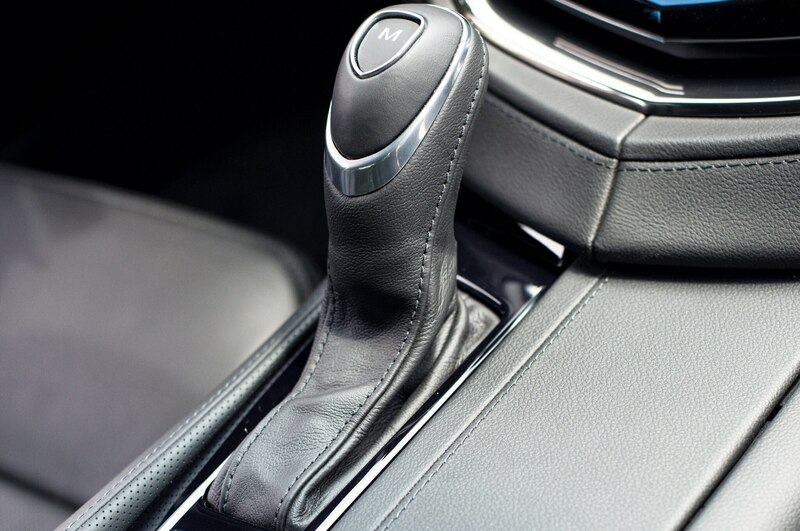 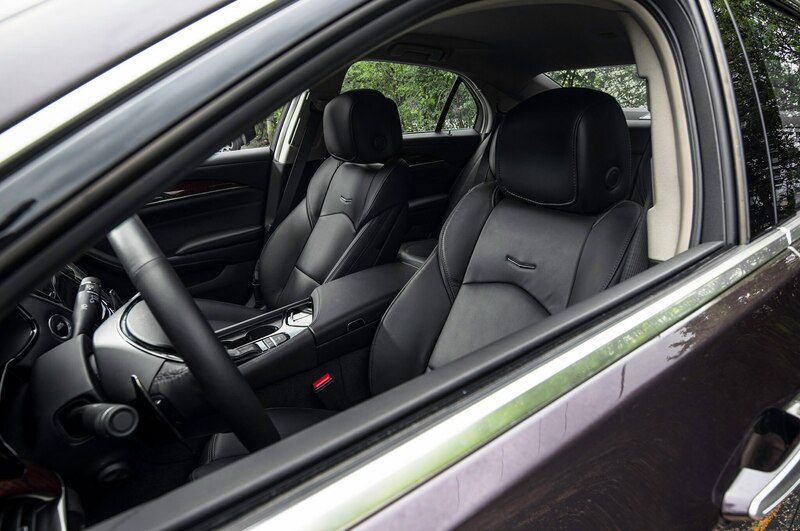 Dad commented on the Vsport’s straight-line performance, whereas Mom liked the comfort of the cooled front seats. 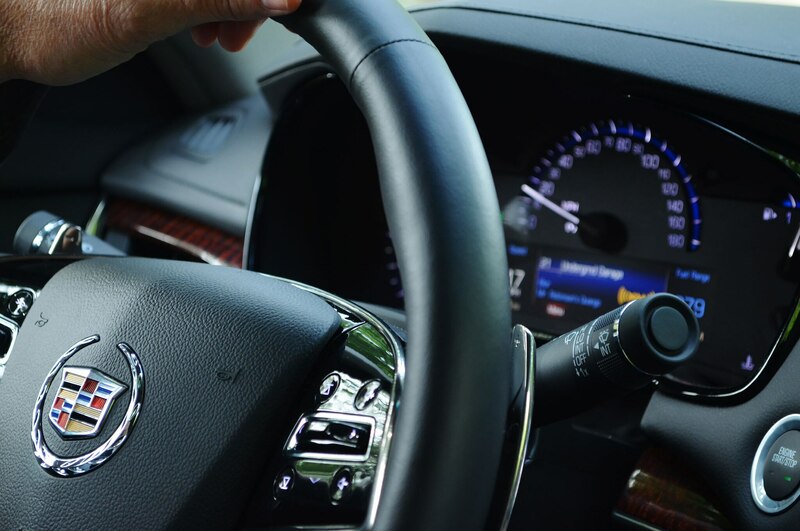 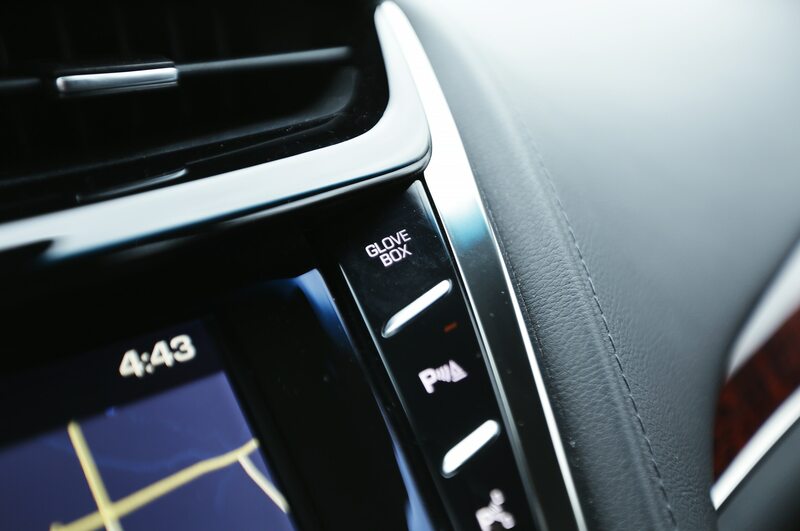 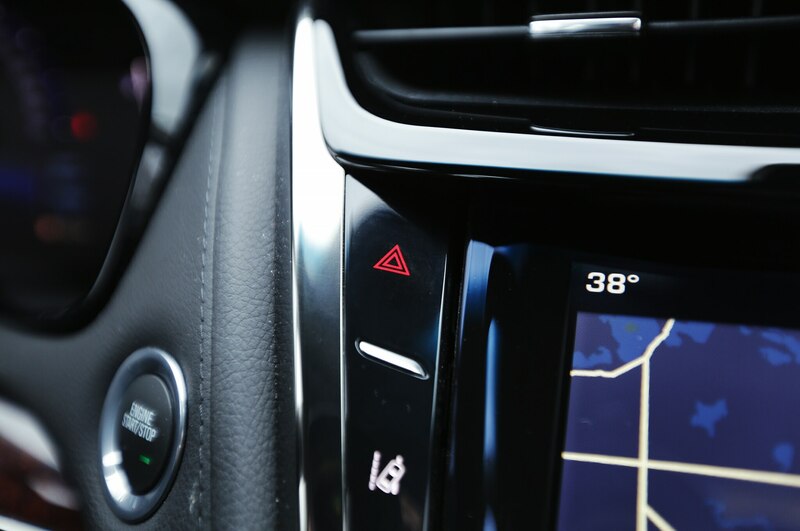 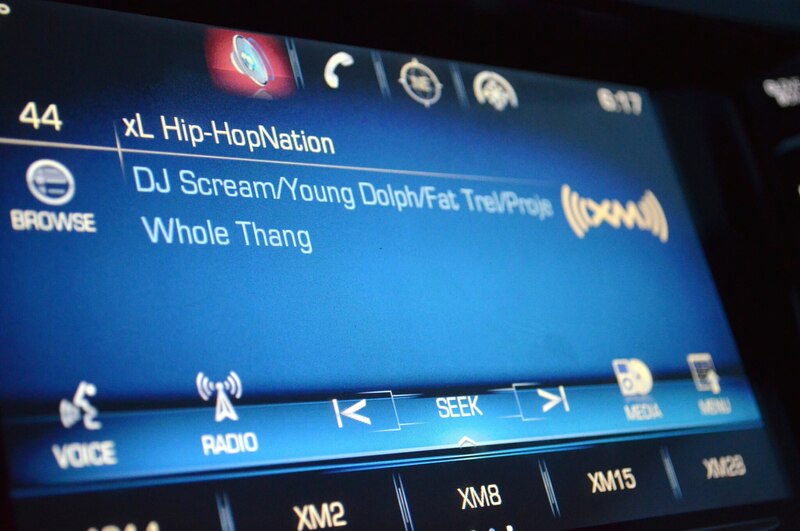 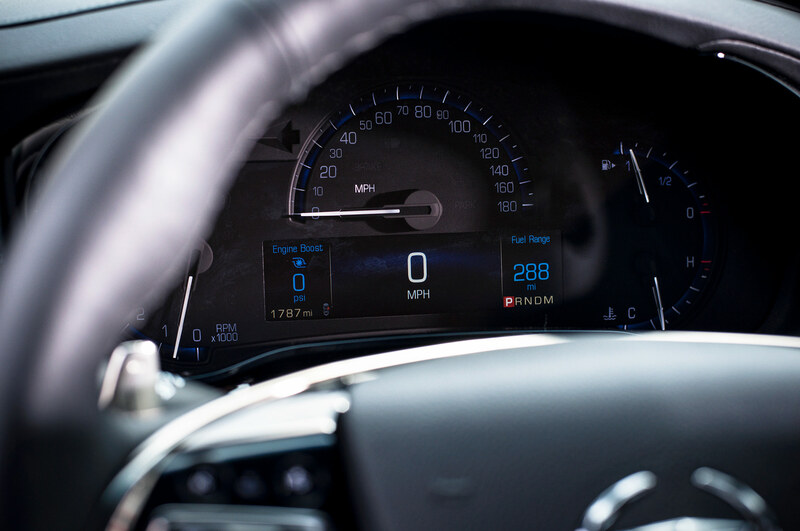 The combo of broadcast and Sirius XM radio and iPod connectivity made the 700-plus-mile round trip go quickly, though the car’s oft-maligned CUE touchscreen infotainment/navigation system proved fussy at times when trying to switch between media. 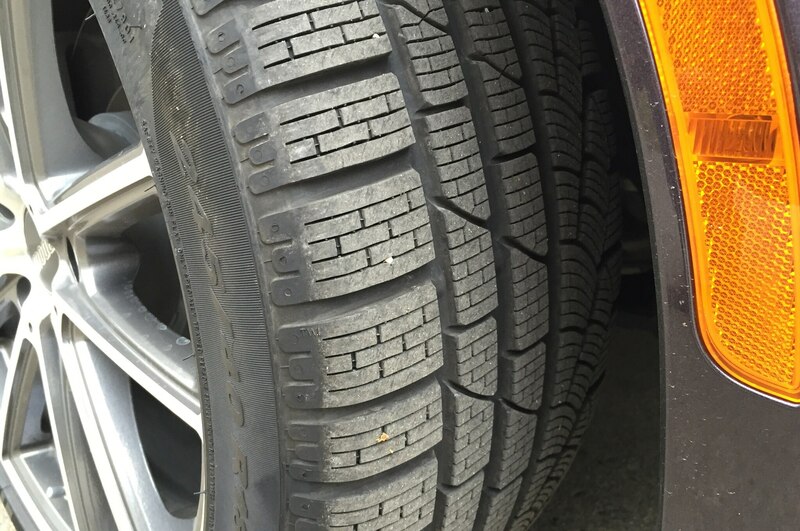 Swap out summer tires for winters on a sports car, and you’re in for more road/tire noise and some tread-squirm. 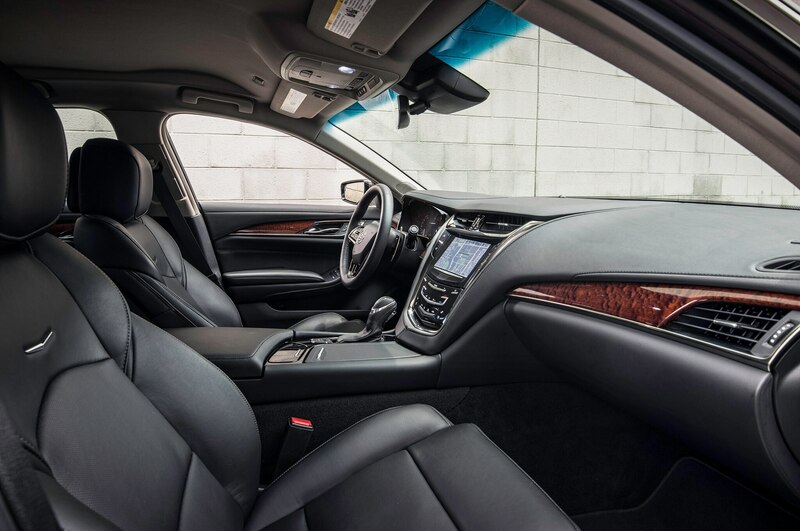 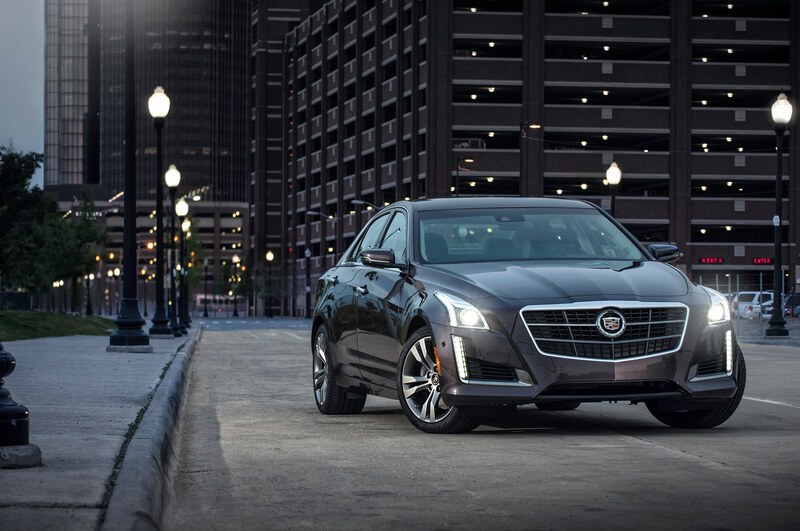 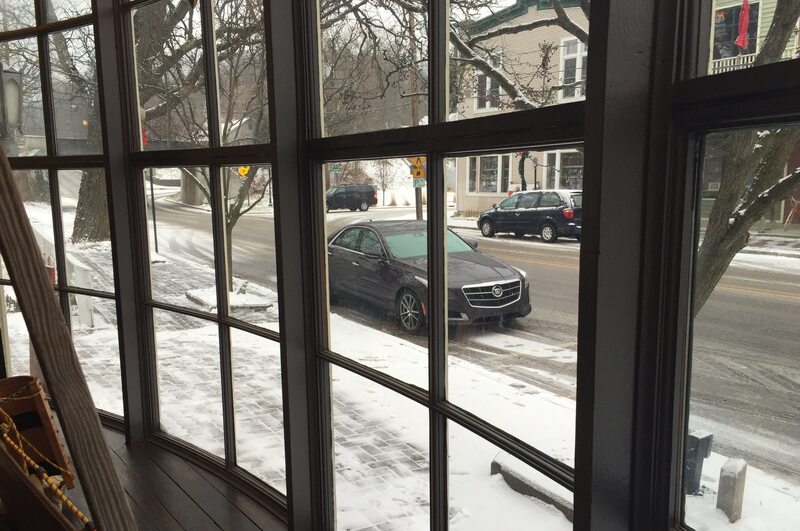 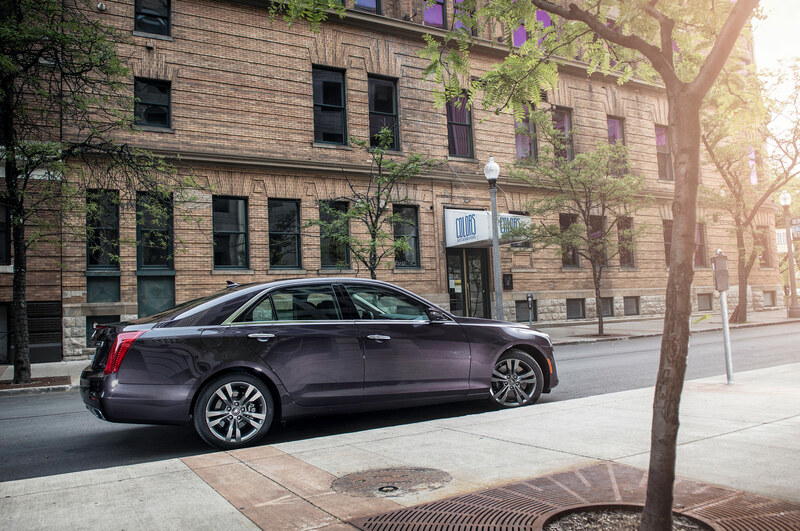 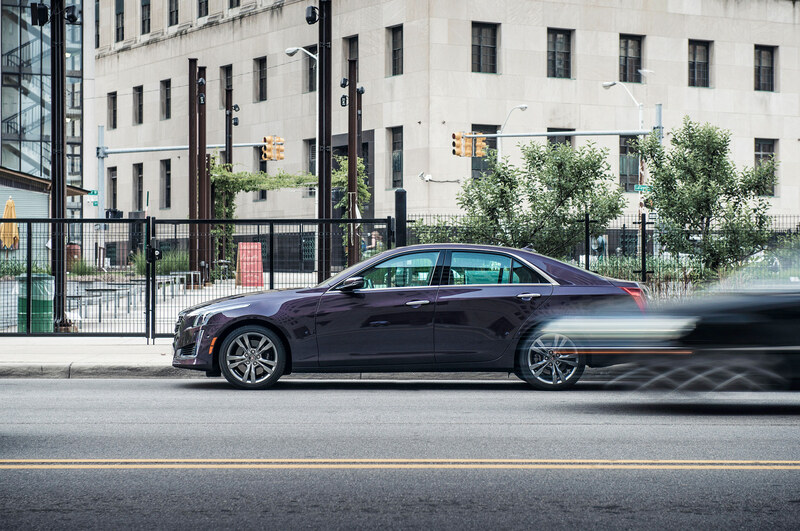 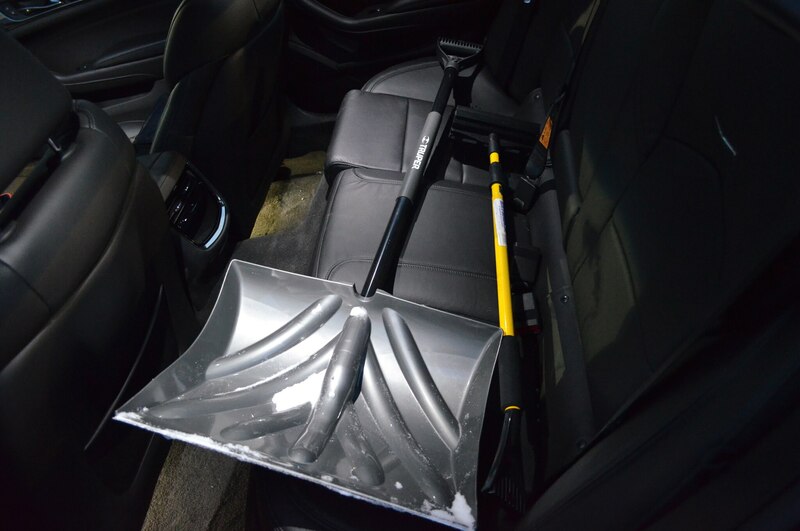 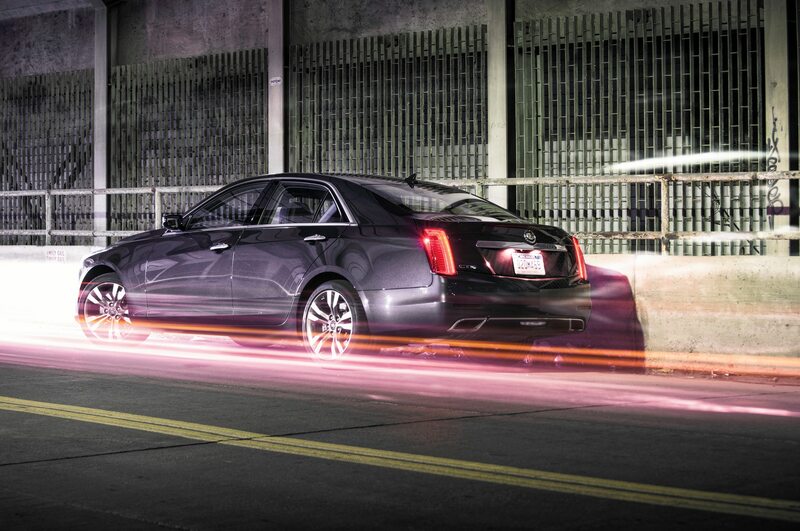 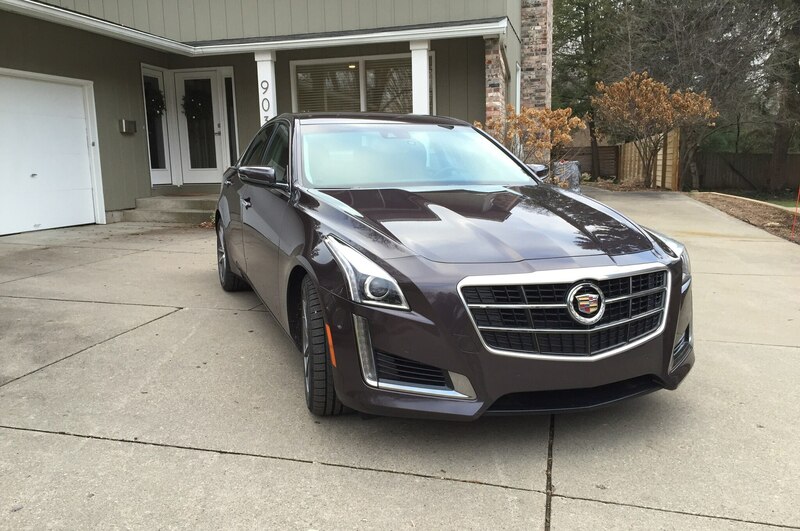 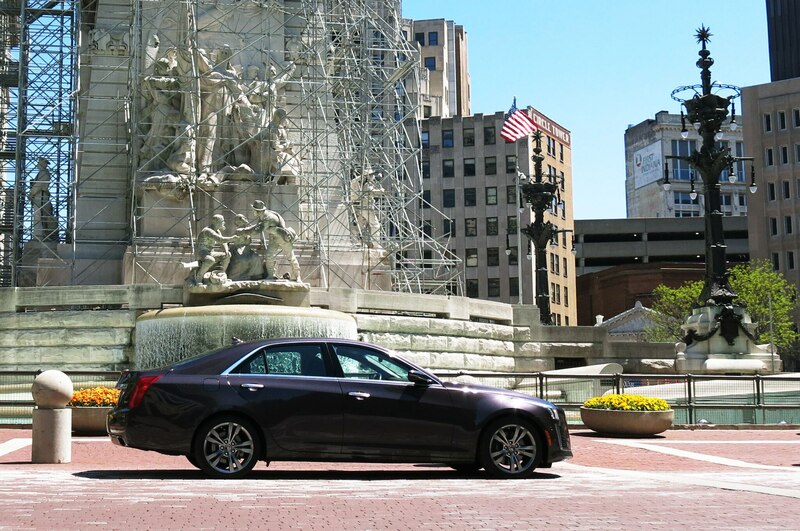 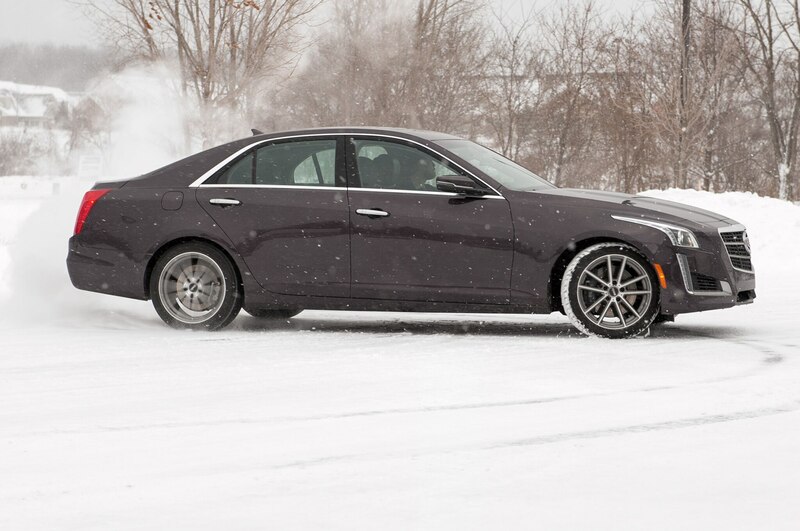 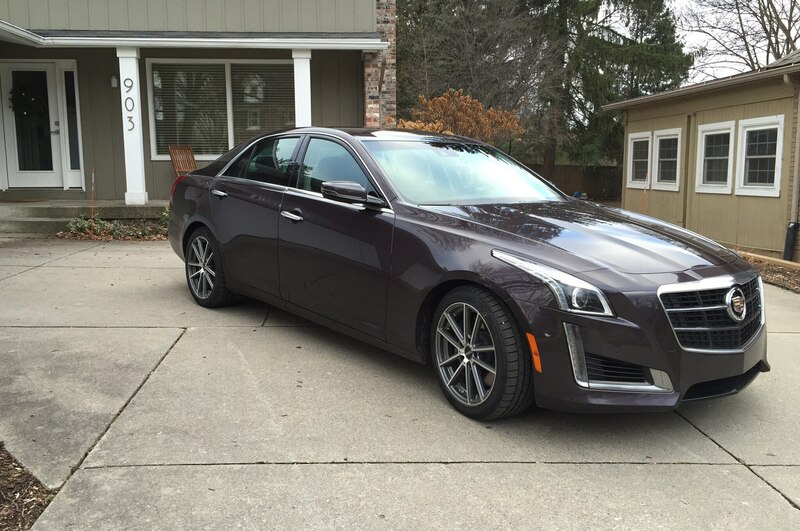 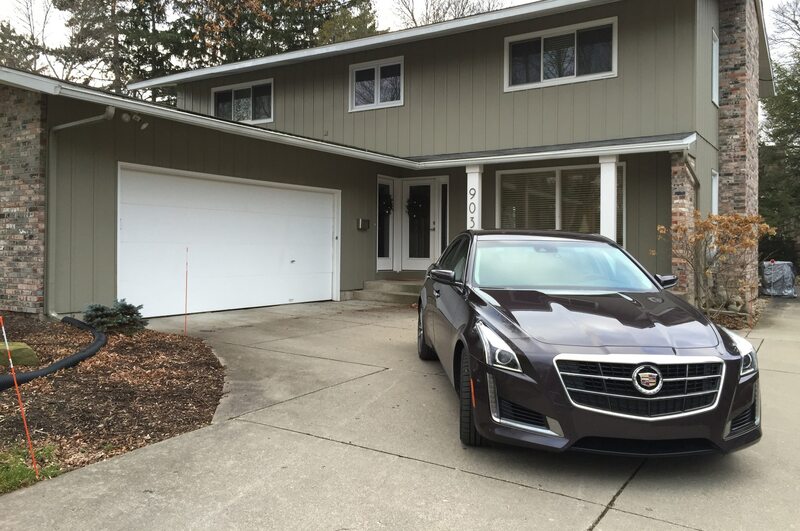 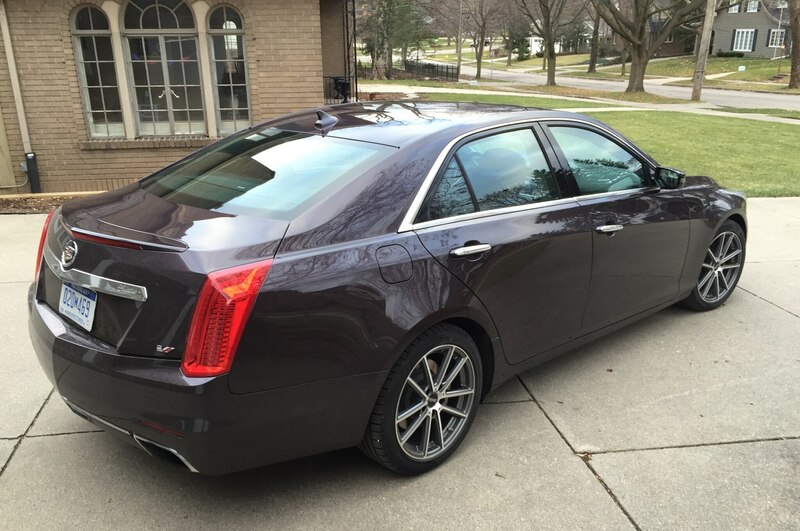 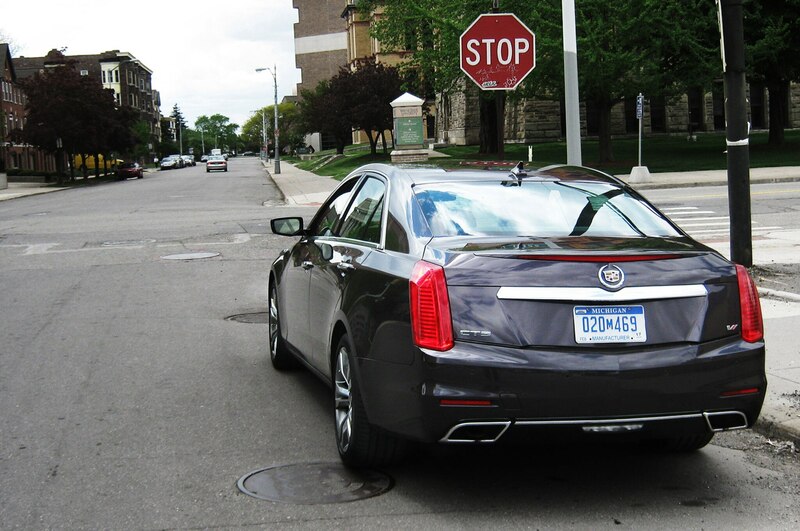 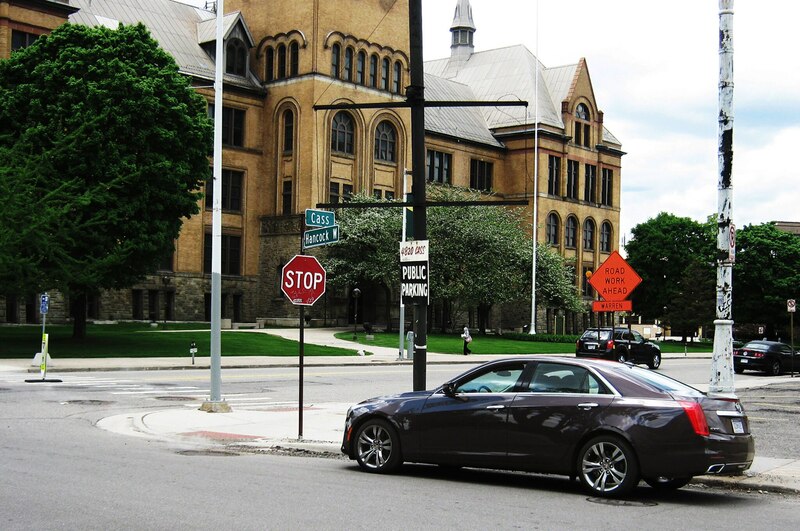 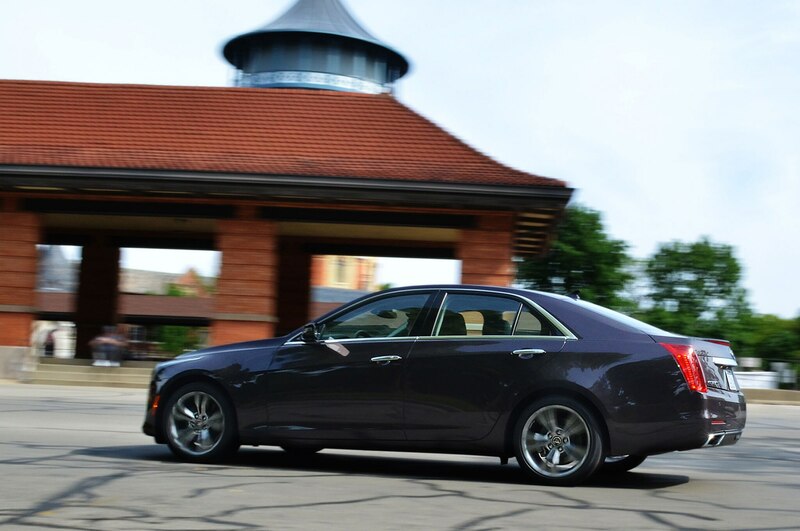 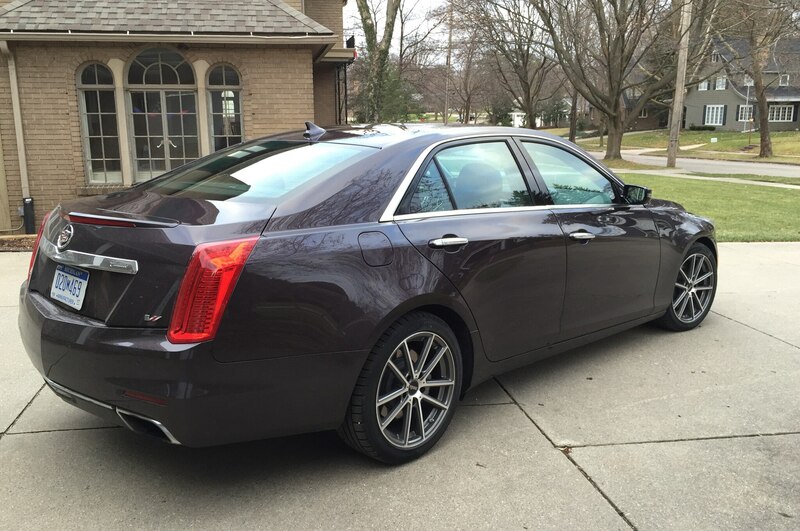 The 2014 Cadillac CTS Vsport proved no exception, but it was well worth the trade-off. 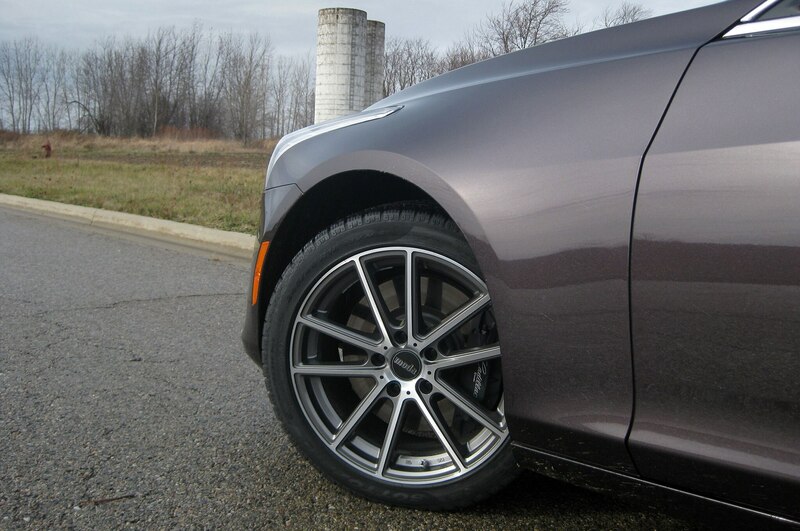 A $2,309 winter package from our partners at Tire Rack included Pirelli Sottozero Serie II run-flat tires on Moda MD19 wheels, a tire pressure monitoring system, and an Ateq VT15 monitoring tool. 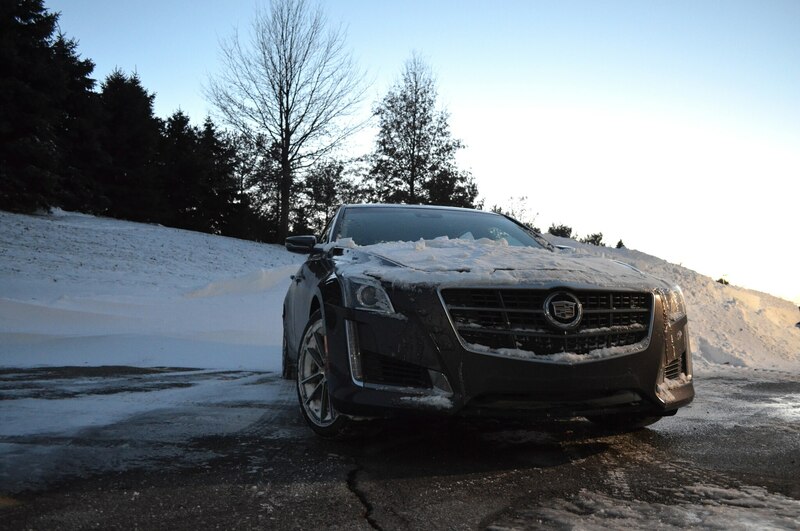 After getting it all mounted up, we gave the car to Michigan-based contributor Marc Noordeloos for most of January. 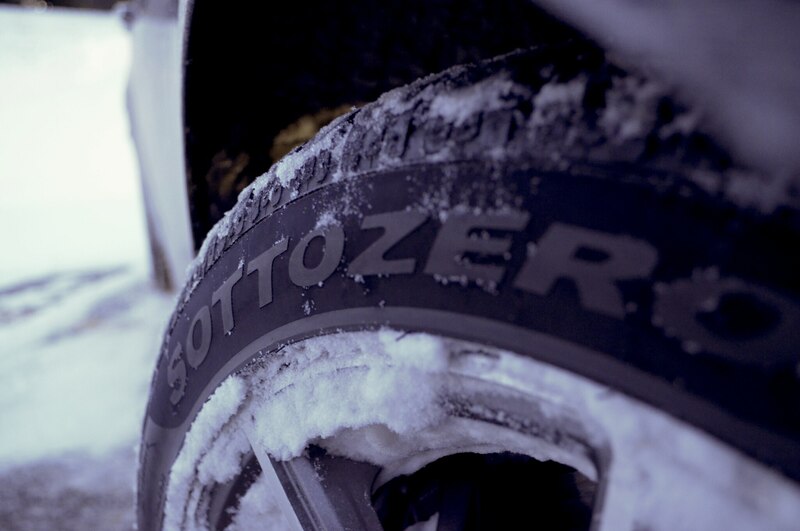 An avowed German car fanatic, he threw some ice water on our collective Vsport love fest, although the winter setup might have colored his judgment some. 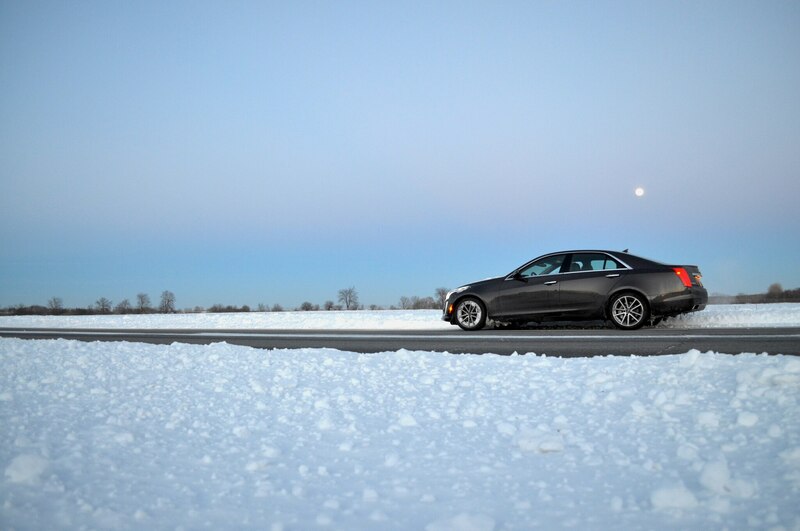 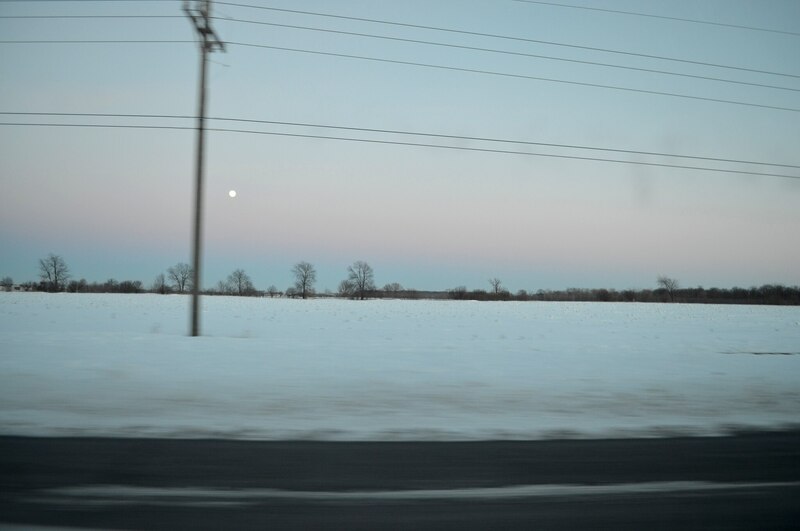 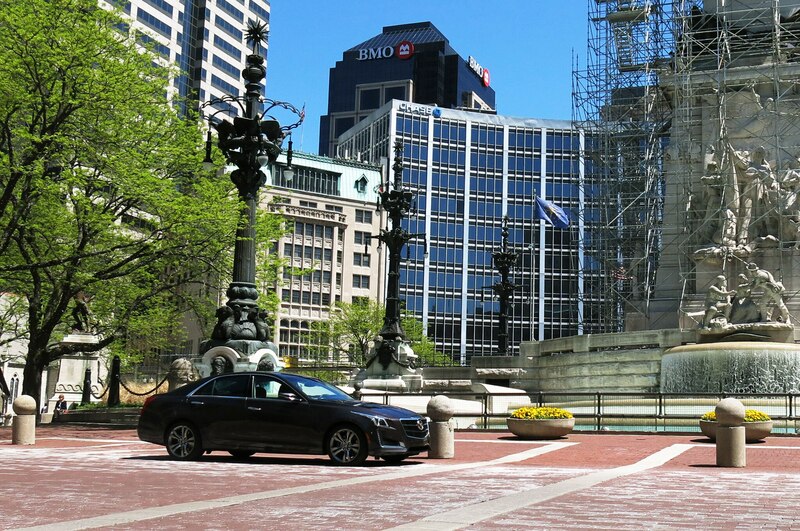 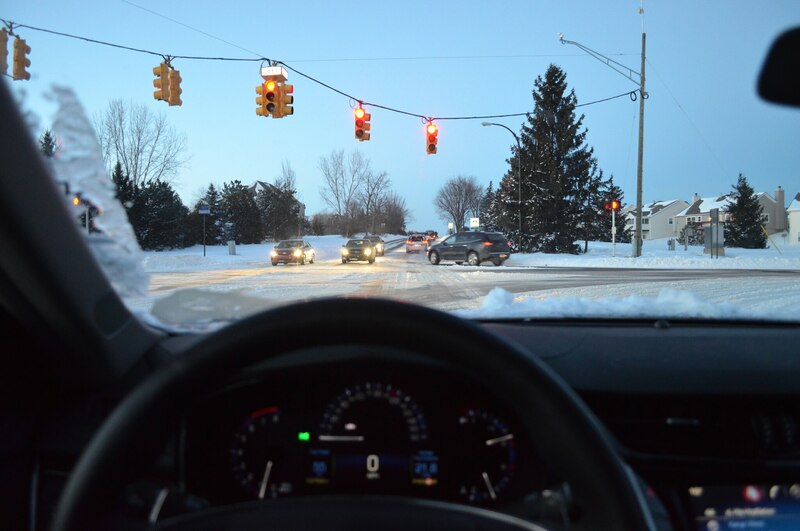 Shortly after Noordeloos returned the car, Capparella crested the wave between Detroit’s lingering winter and Nashville’s early spring with a 1,600-mile round-trip to visit family. 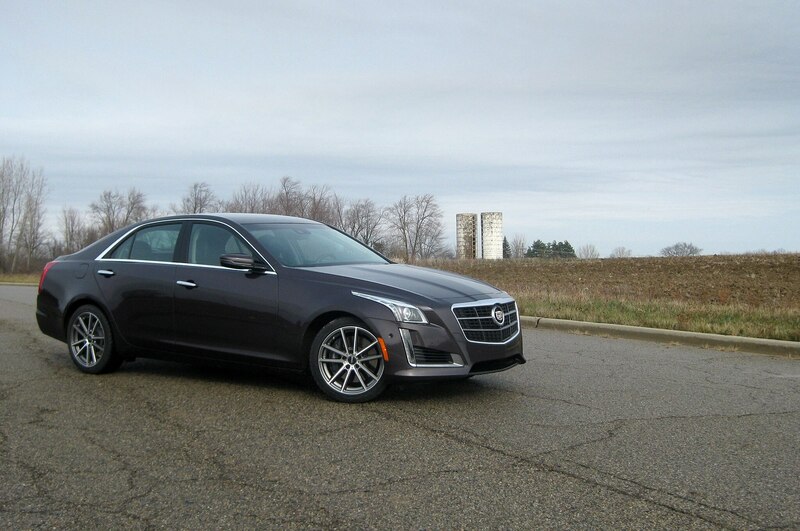 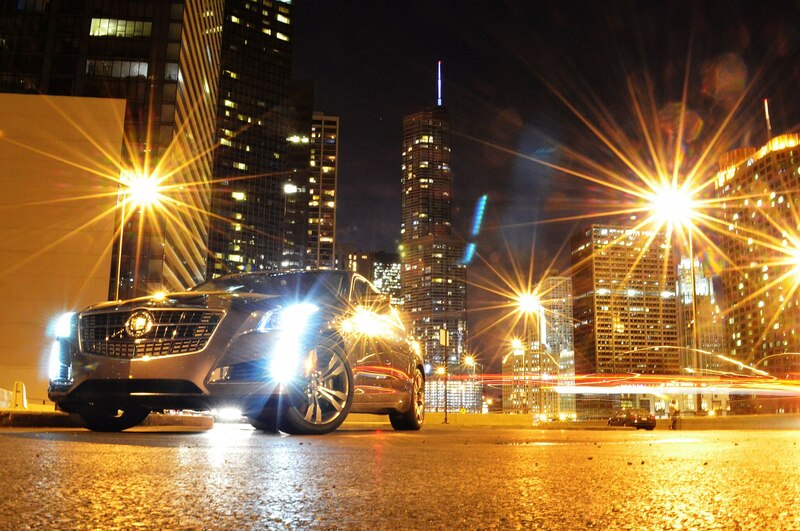 Unfortunately, the CTS also proved similar to our long-term ATS in its less-than-stellar build quality. 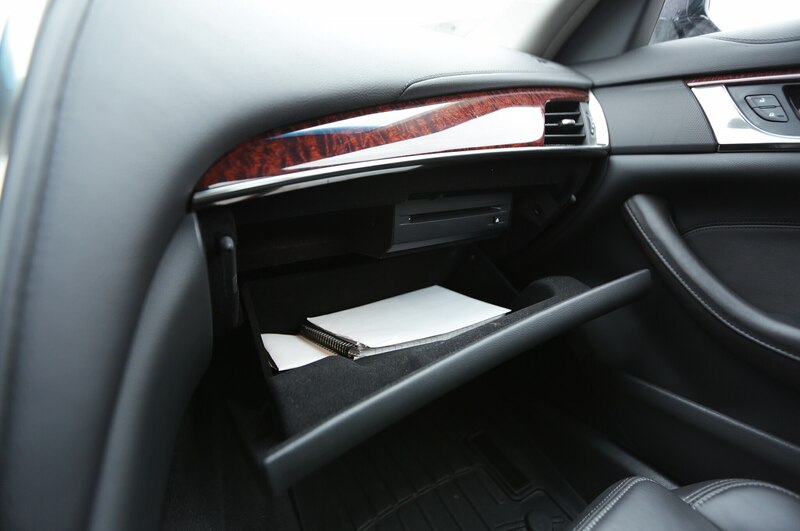 We noted disappointing creaks, and a fussy glove-box door required a visit to the dealer. 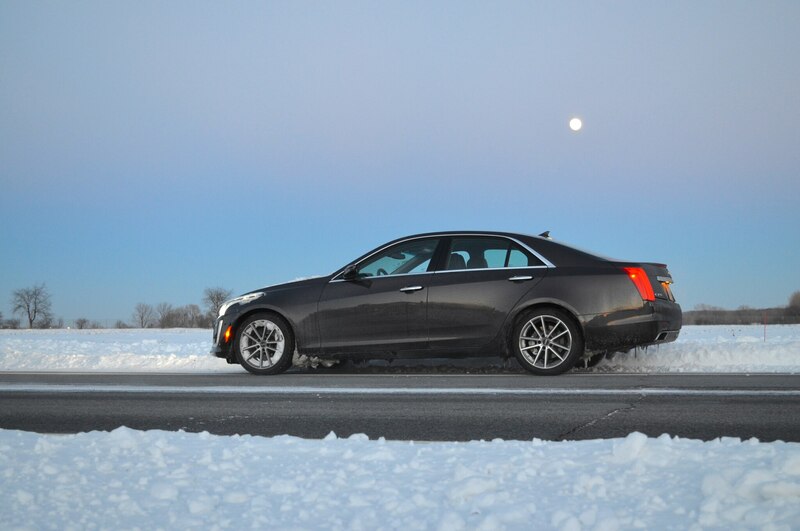 The twin-turbo V-6 also exhibited the same cold, rough idle as our ATS sedan equipped with the naturally aspirated 3.6-liter six. 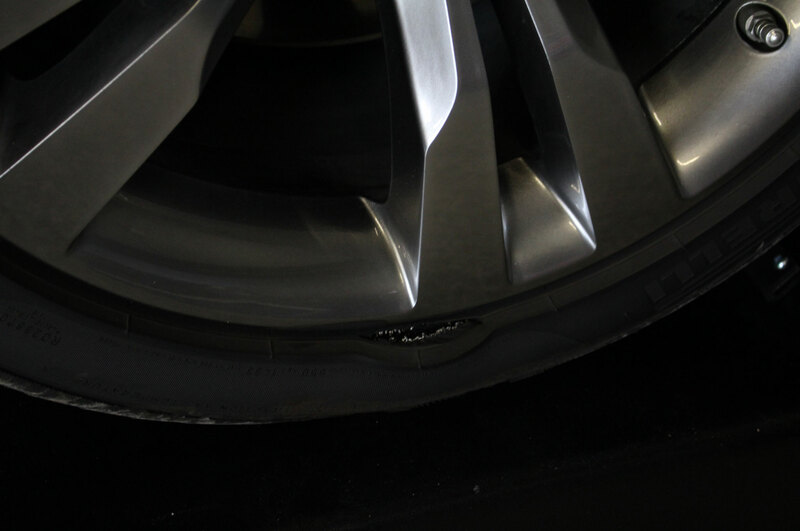 The problem in the Vsport wasn’t as pronounced at first, but it worsened during the year. 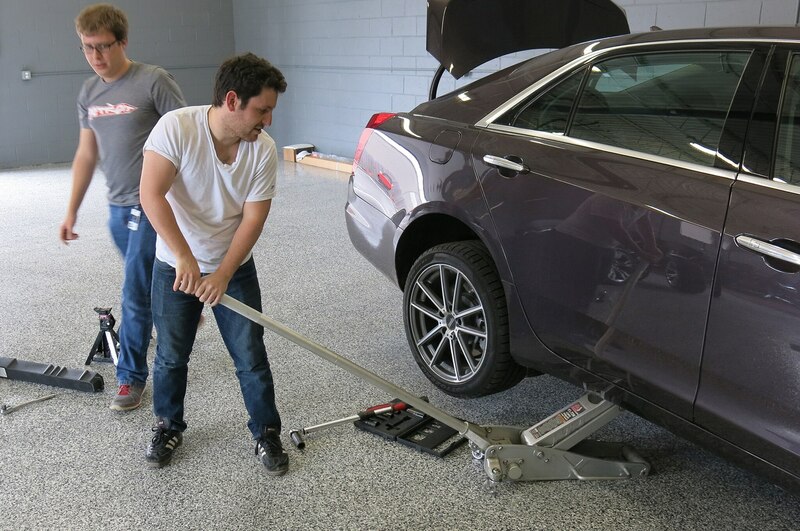 Since we could never get it fixed to our satisfaction in the ATS, we chalked it up to an engineering flaw, possibly inherent to the combination of the big V-6 and the super-stiff platform. 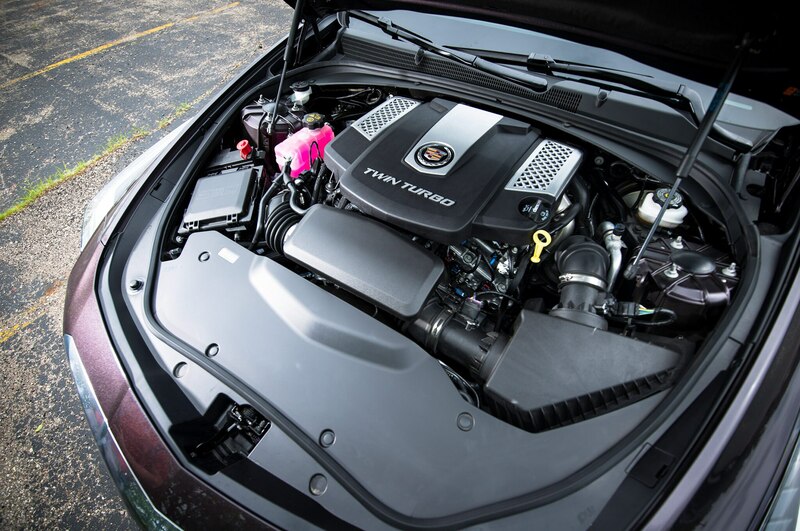 Hey, there’s a reason BMW arranges its six cylinders in neat rows. 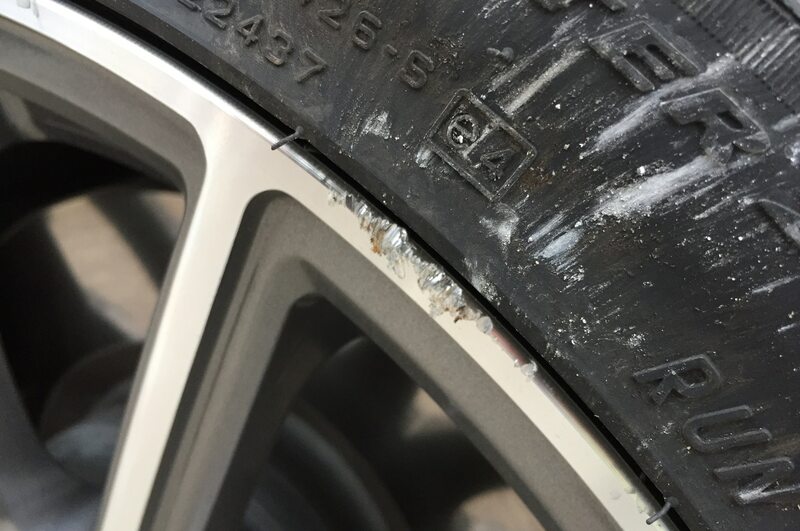 Then there was tire drama. 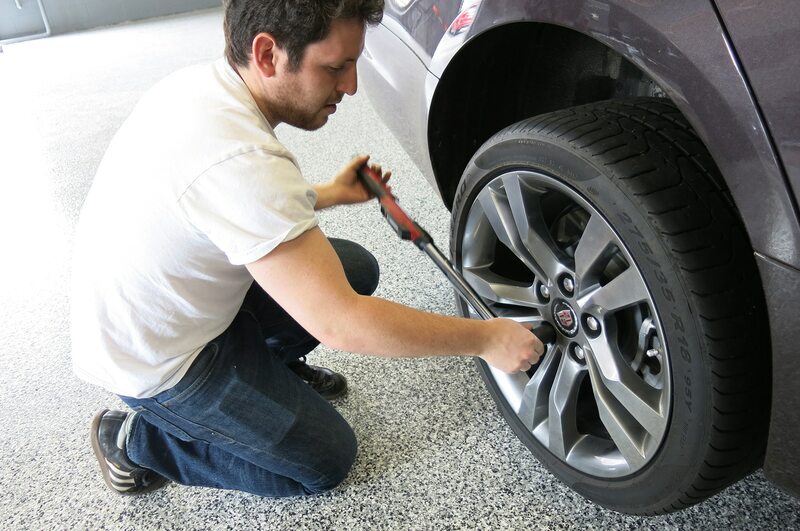 Daily news editor Jake Holmes visited Tire Rack in South Bend, Indiana, on his way to the Indianapolis 500. 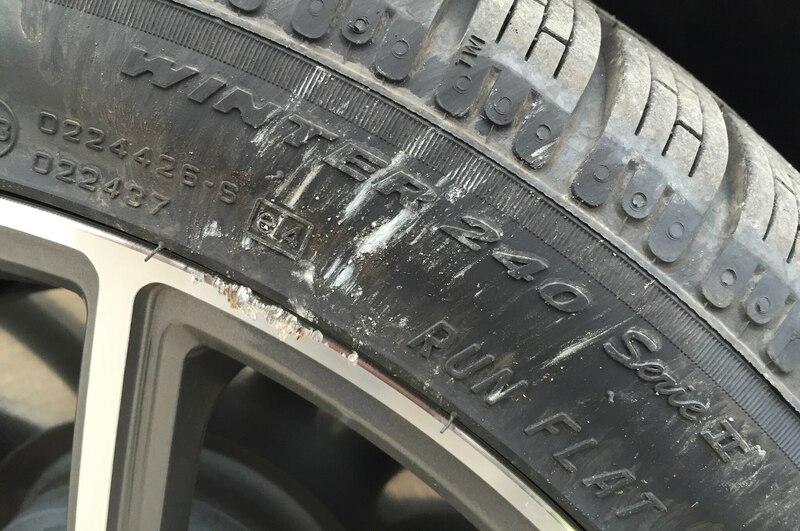 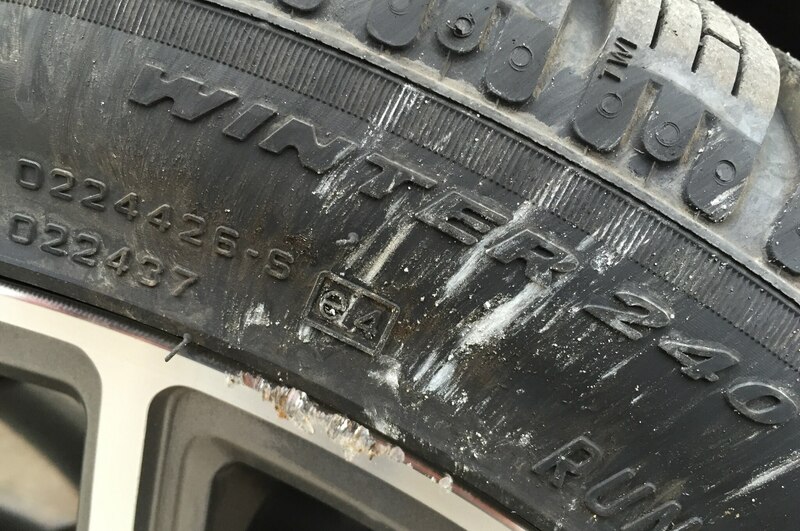 While there, a product expert noted some unevenly worn tread blocks (by now we had switched back to the original tires), which made the ride feel rougher and exacerbated the tires’ willingness to tramline. 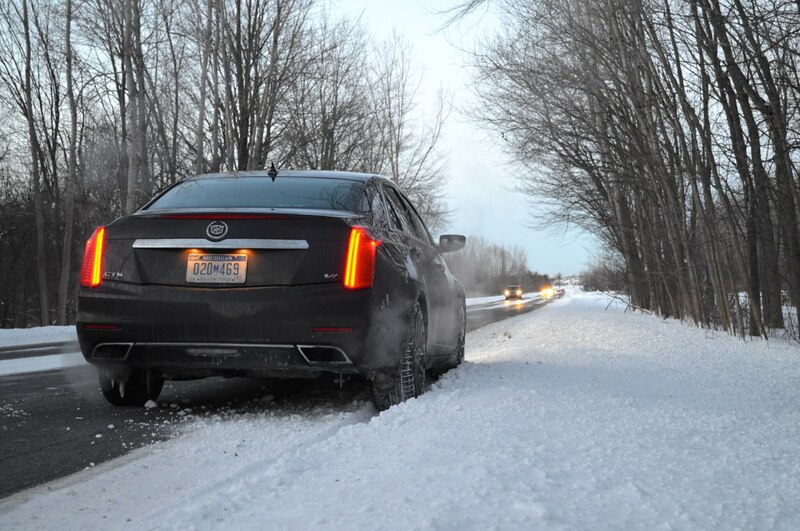 The wear turned into a nasty split after senior editor David Zenlea drove to northern Michigan near the end of our test. 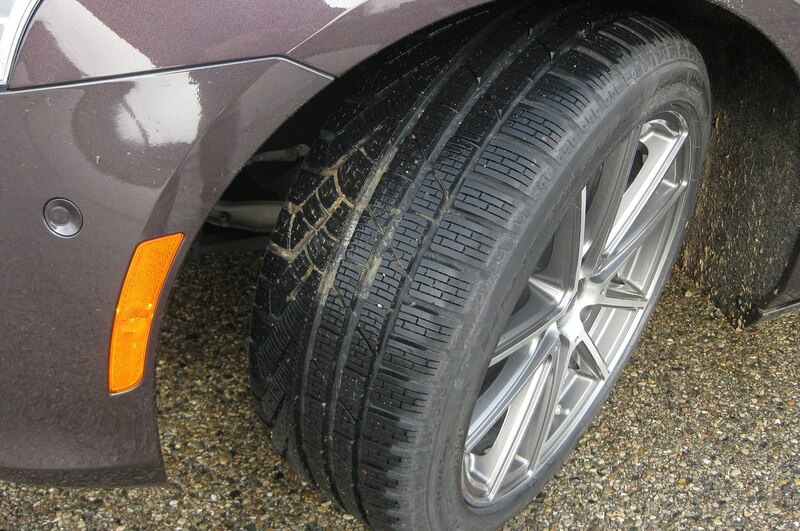 The Tire Rack expert we talked with chalked it up to hard-cornering auto journalists, although diagonal wear on the front tire treads is apparently common, especially in rear-wheel-drive vehicles. 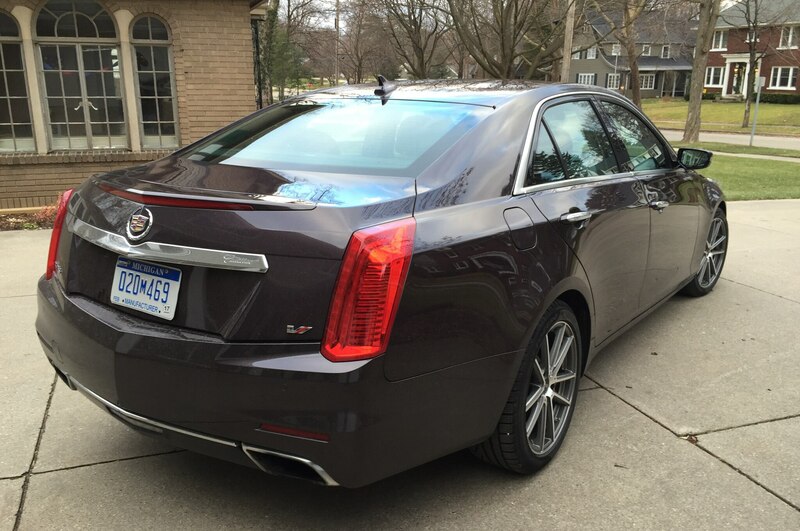 We replaced the right front P Zero ($262.44) just before returning the car to Cadillac. 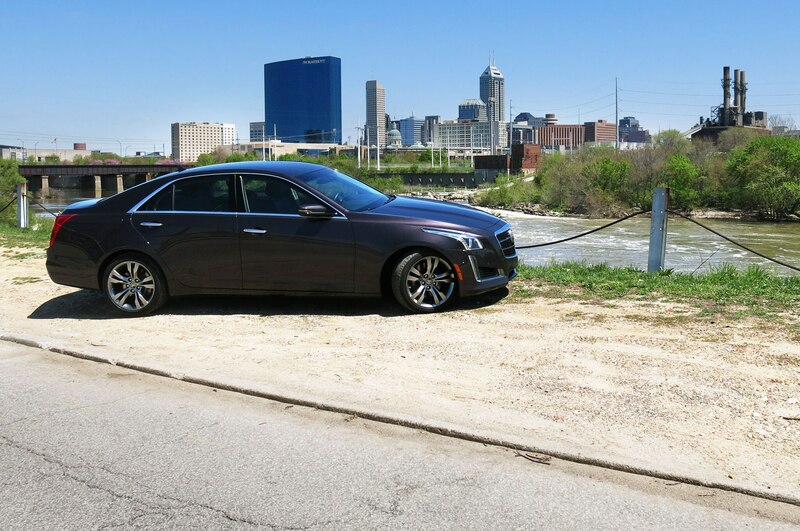 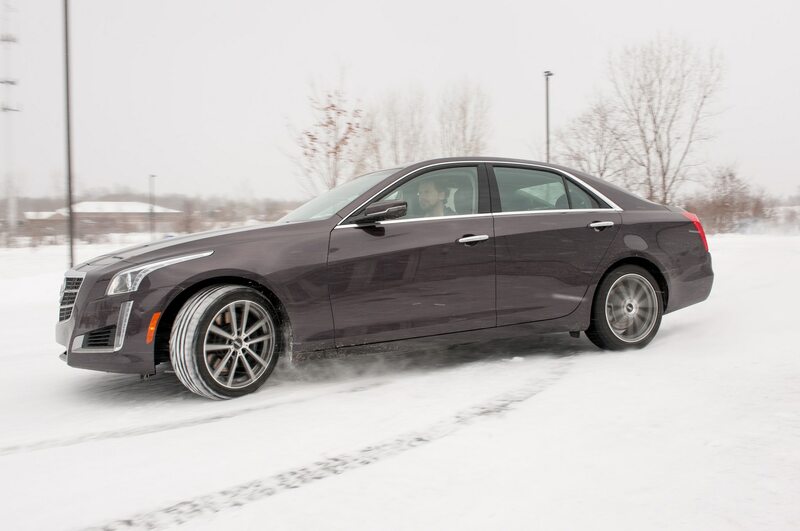 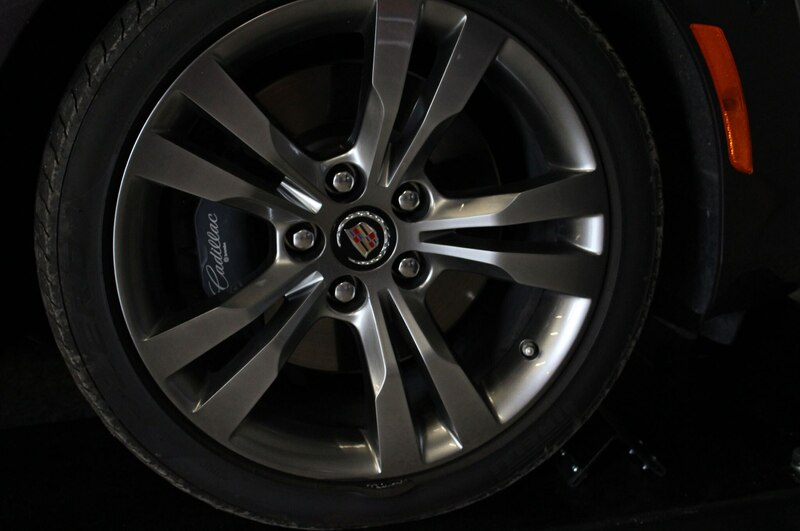 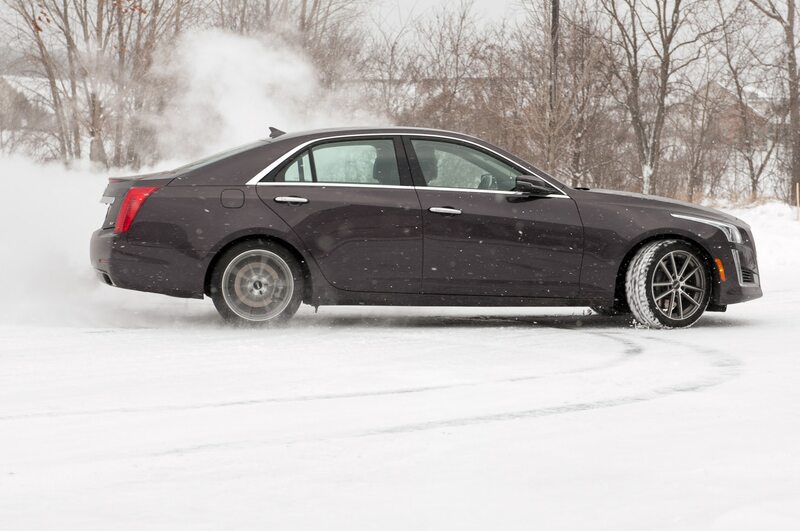 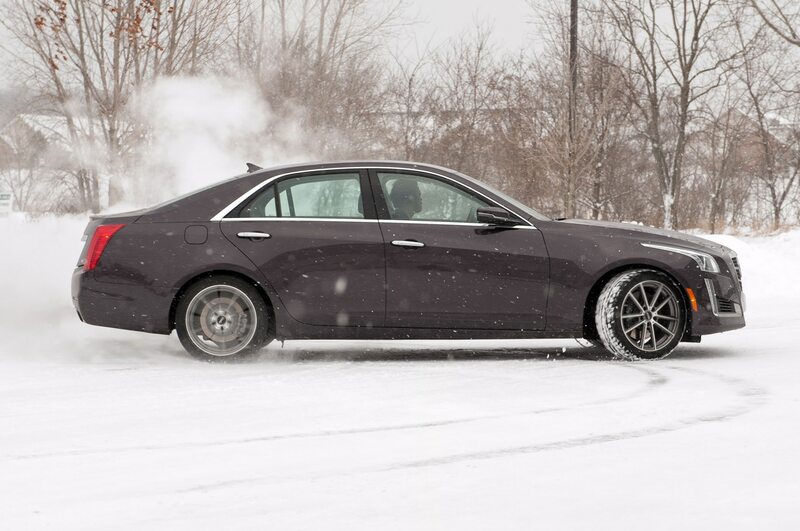 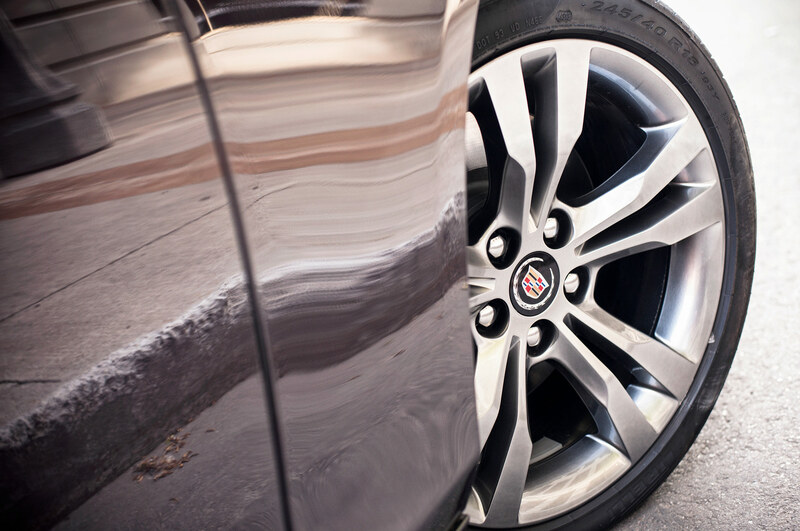 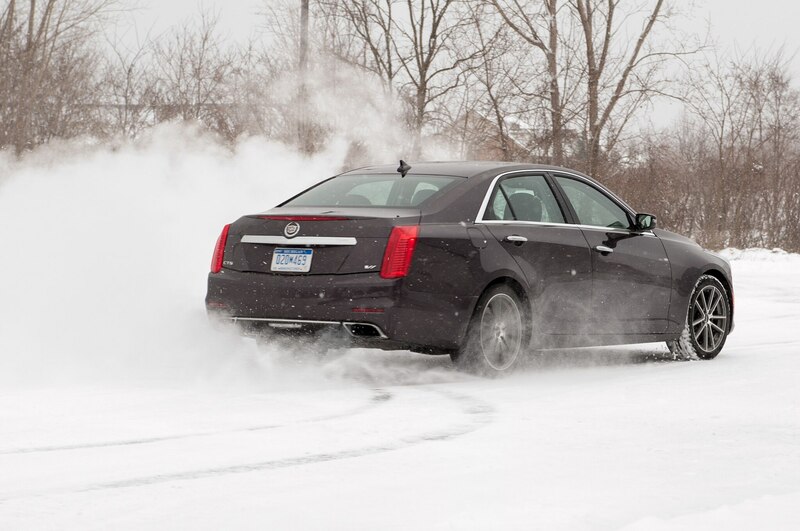 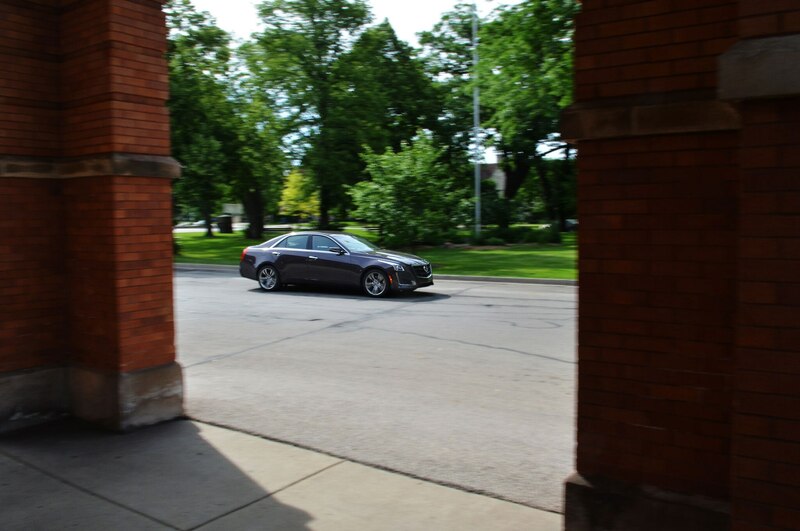 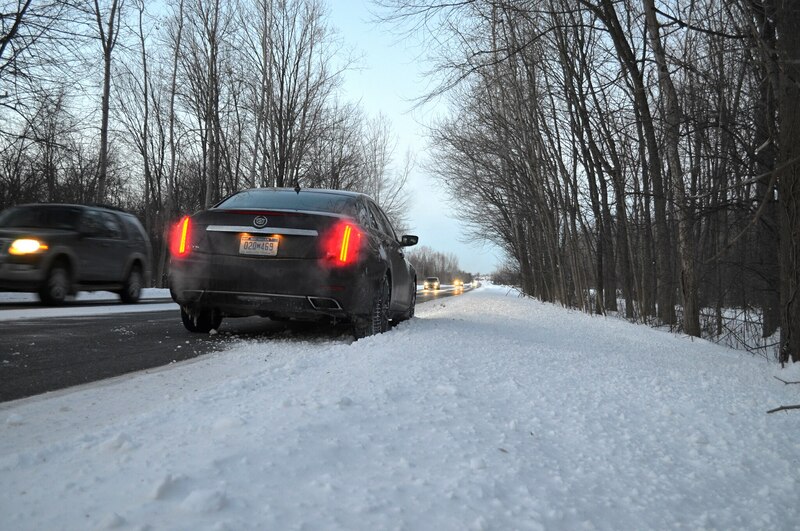 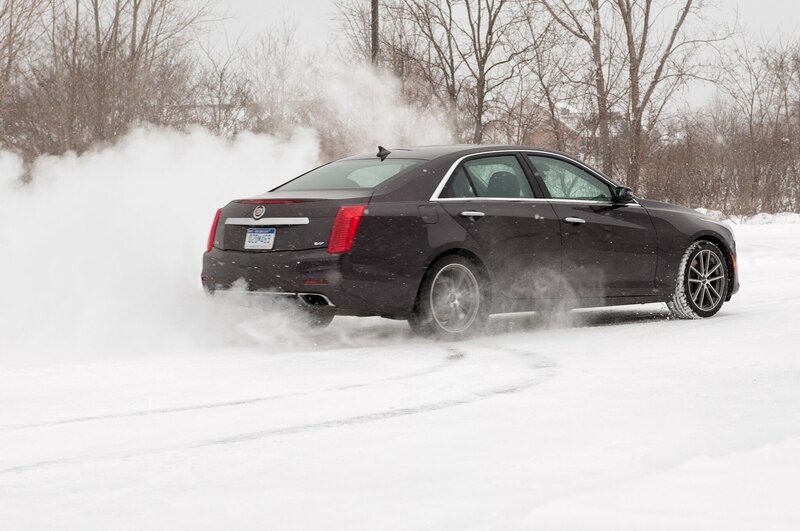 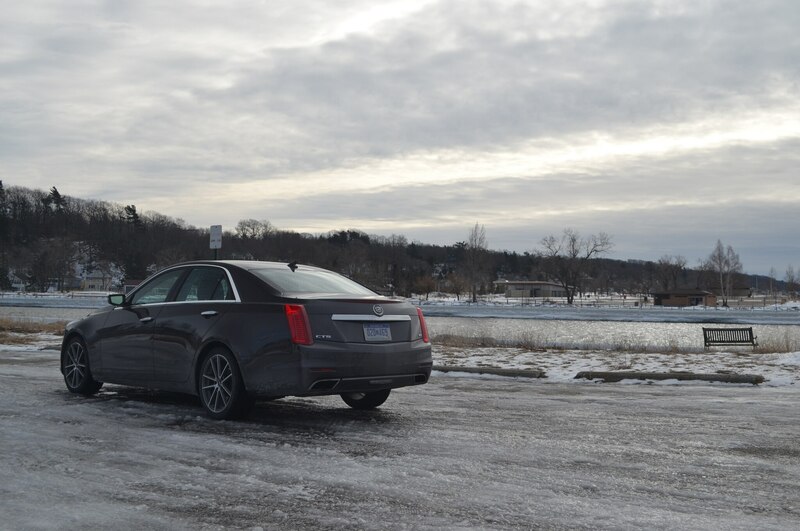 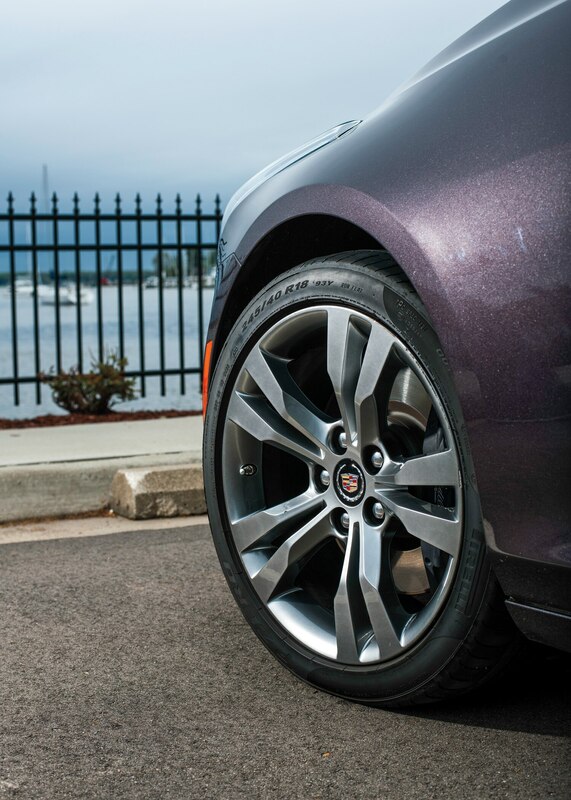 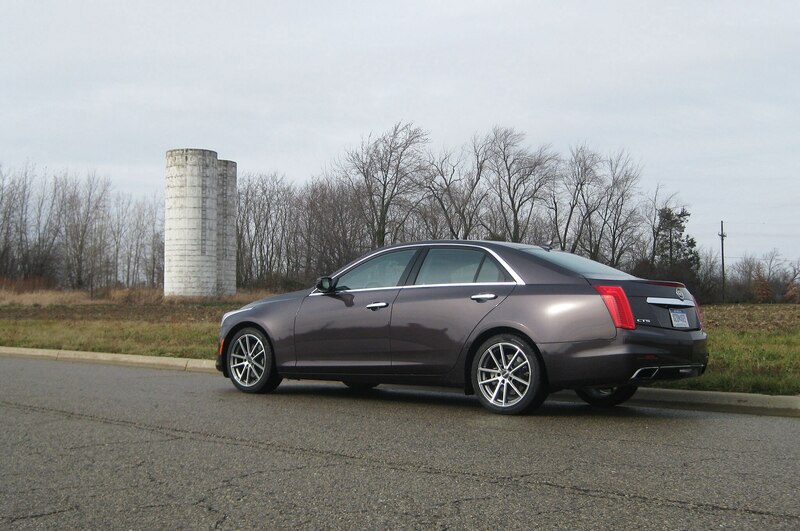 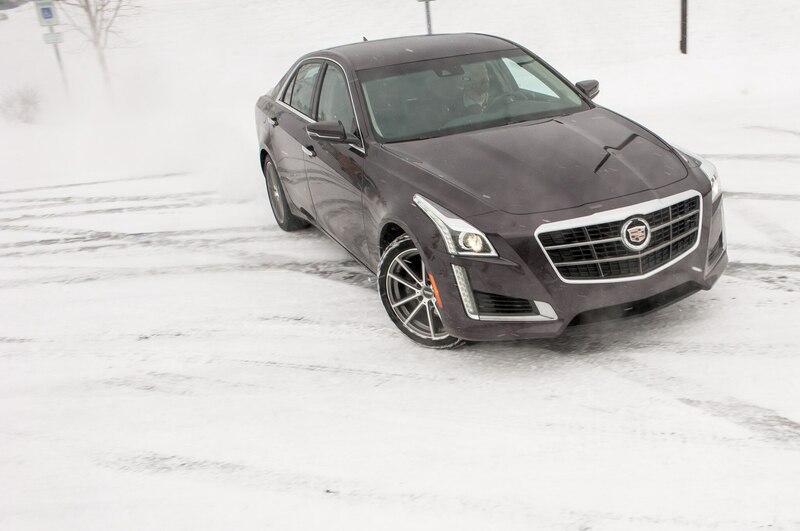 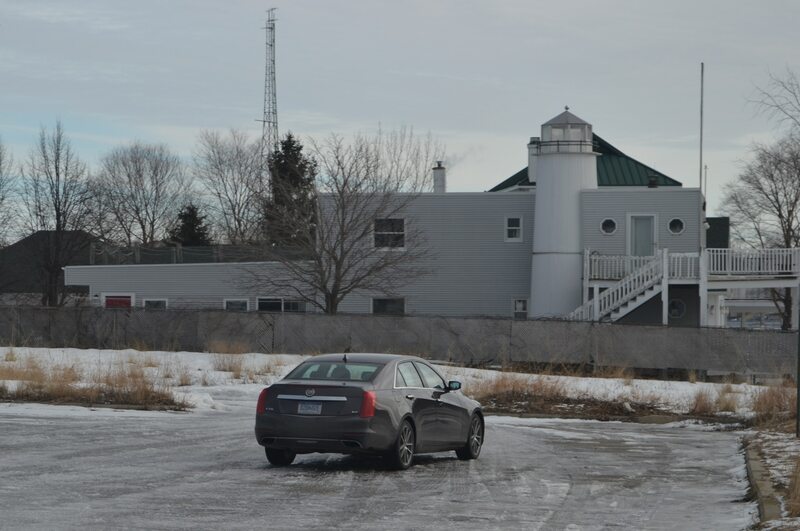 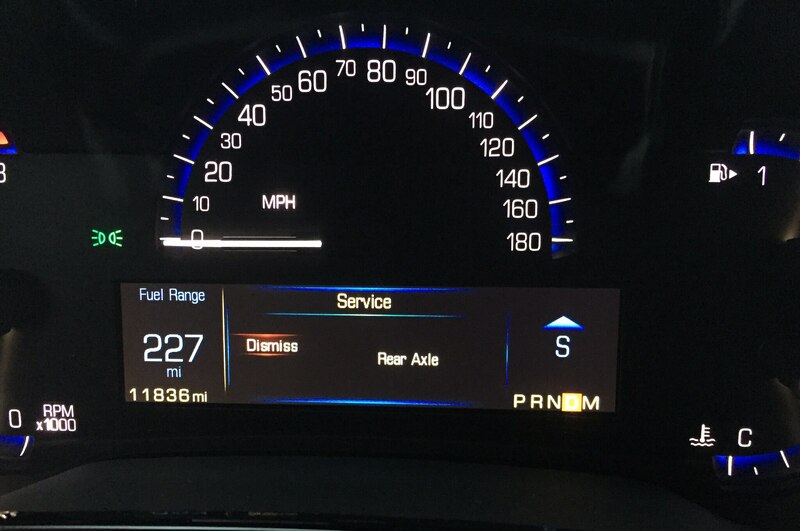 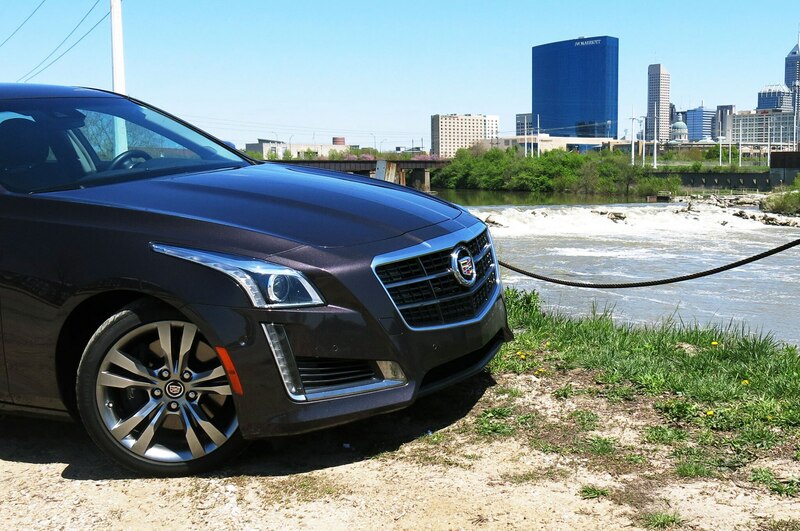 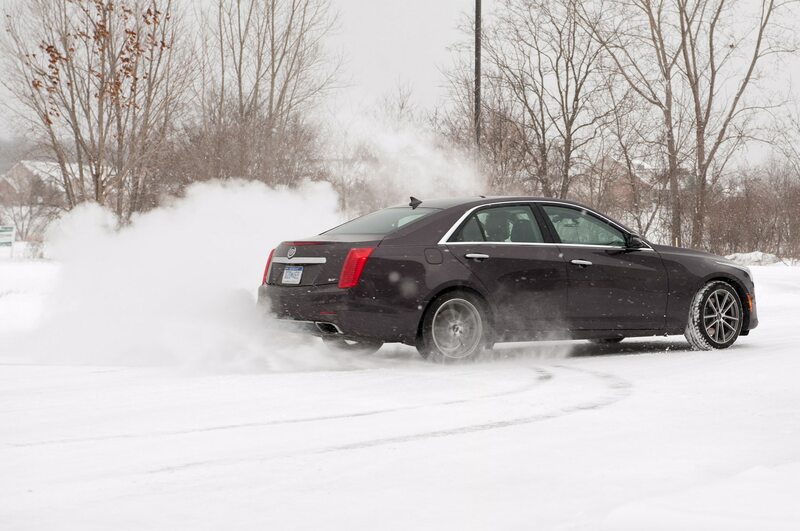 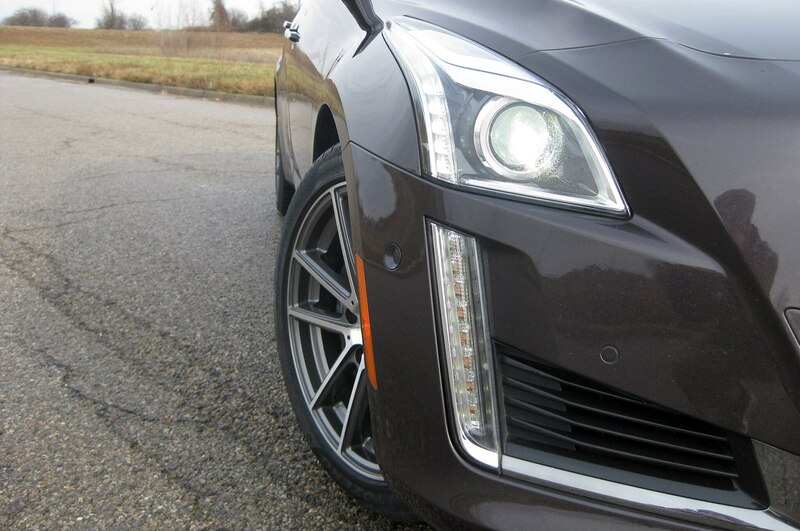 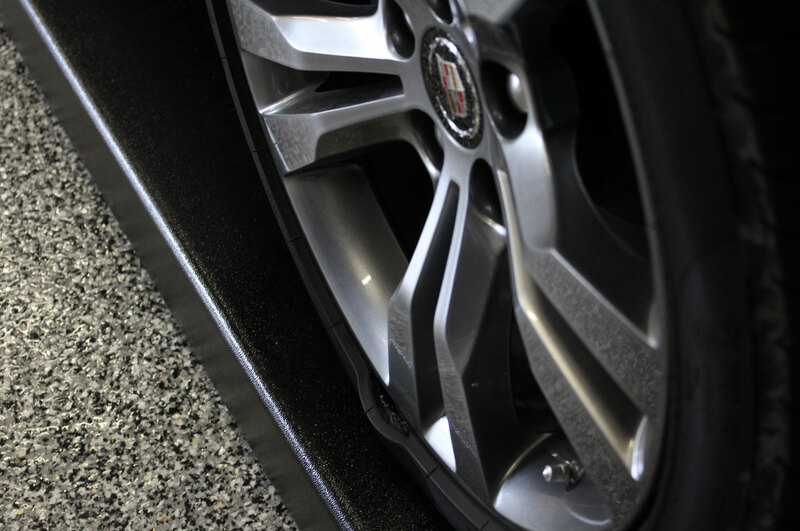 The tire issues summed up our year with the 2014 Cadillac CTS Vsport nicely; we drove the wheels off an American luxury sedan that is every bit as engaging dynamically as any car in its class. 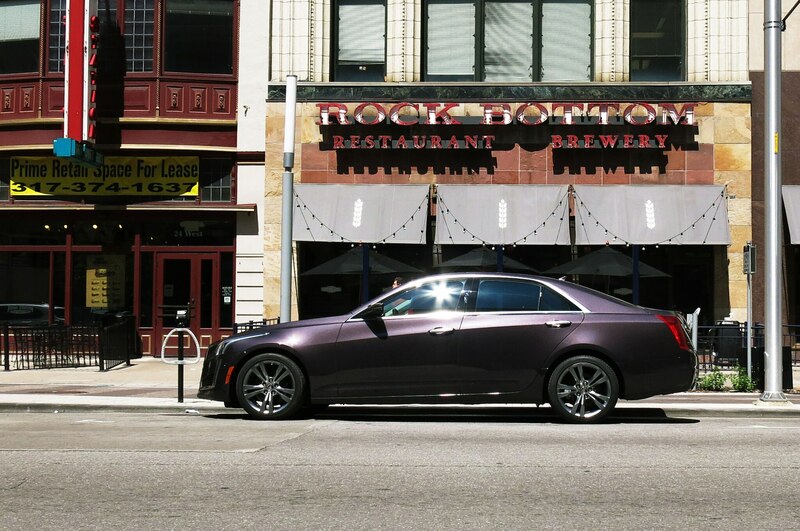 To the end, it remained a compelling performer. 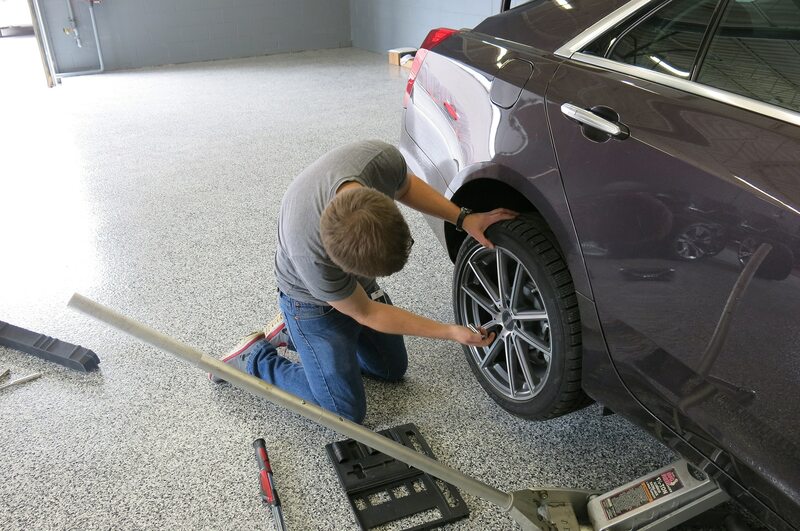 “Incredibly fluid and agile for a big car,” remarked Zenlea after his tire-splitting journey. 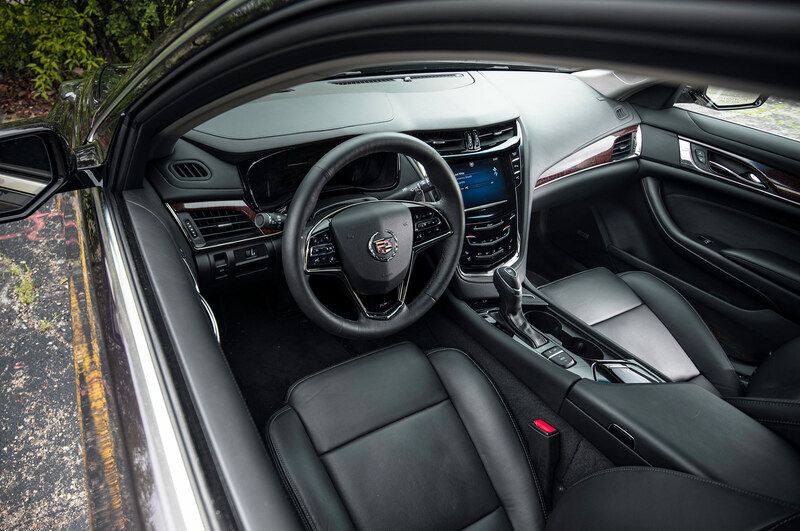 But Cadillac still needs to get its act together on the ride-handling balance, interior quality, and engineering refinement fronts. 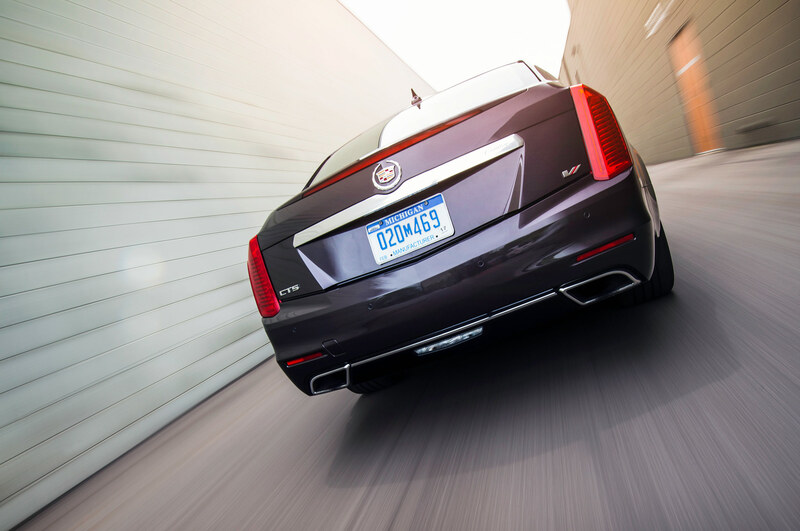 The upcoming CT6 is designed to elevate the brand further with an all-new V-6 engine family that we hope will exorcise the rough-idle issues. 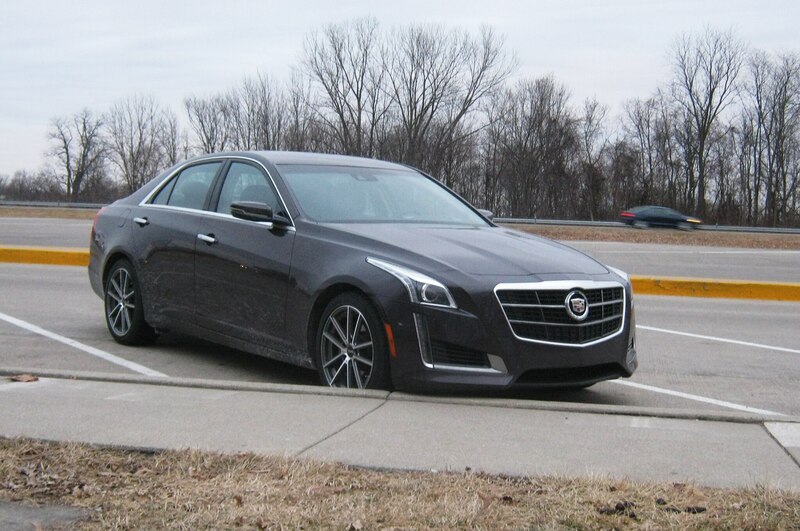 There is little doubt to us, though, after our year with the Vsport that Cadillac is approaching world-class status, and we look forward to seeing how the CT6 will fare in the next installment of Cadillac versus the Germans. 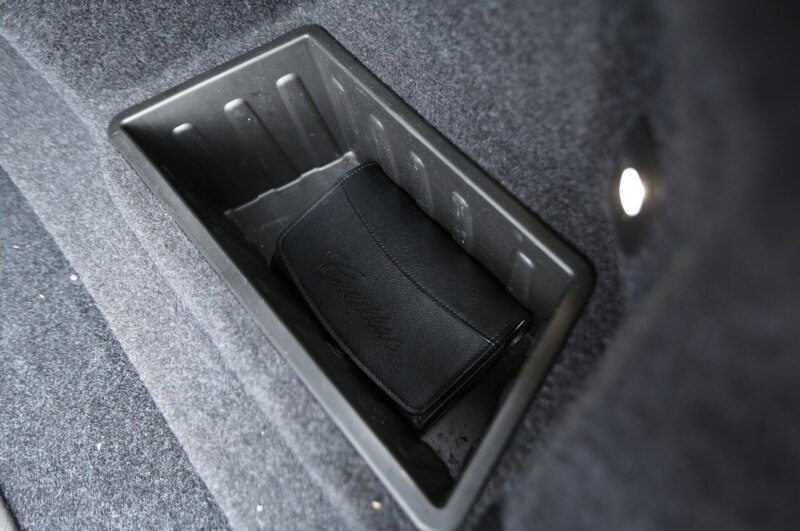 14,288 mi: Replace glove-box door damper. 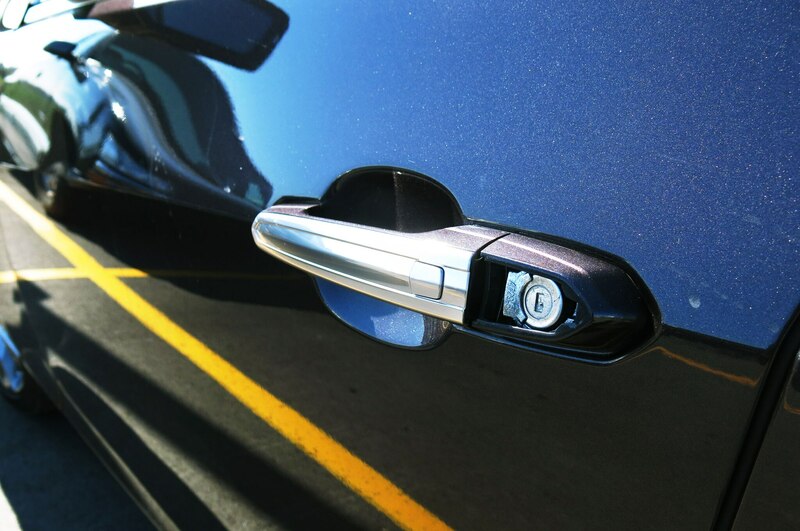 Fix misrouted cable inside rear door handle.